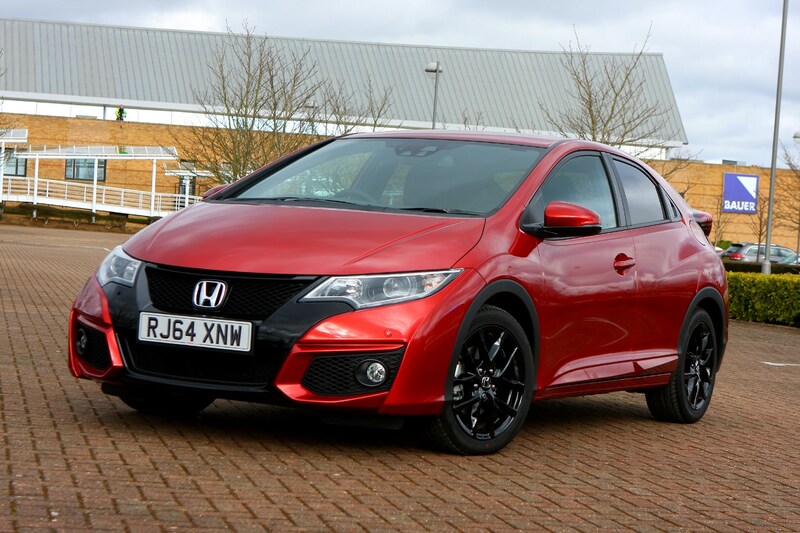 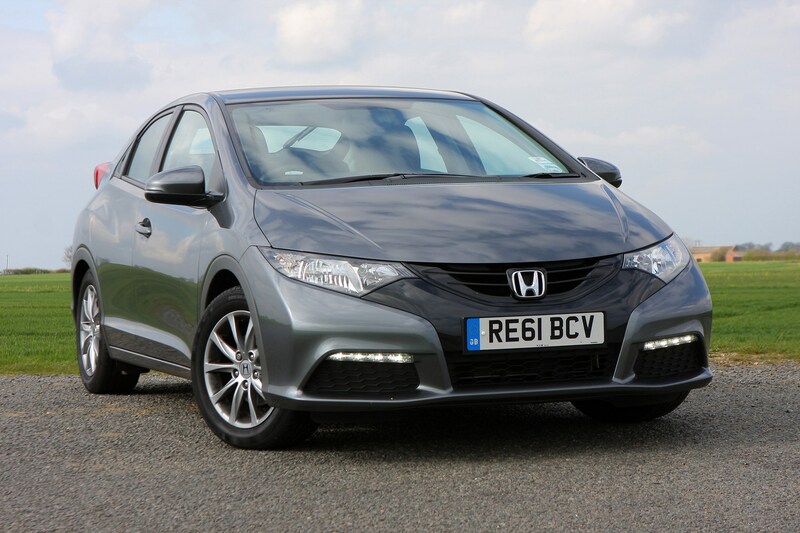 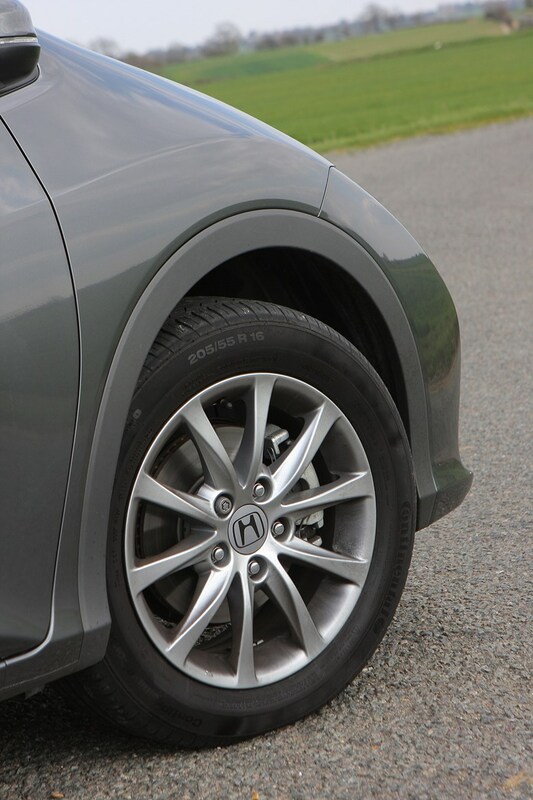 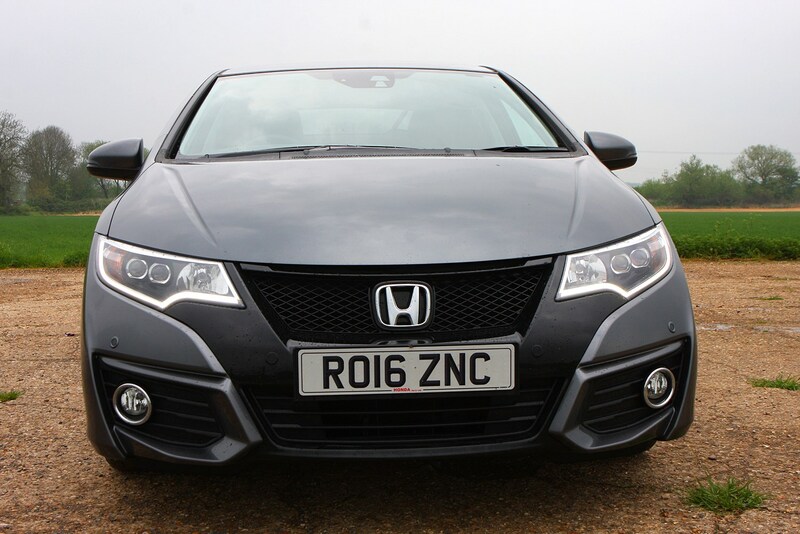 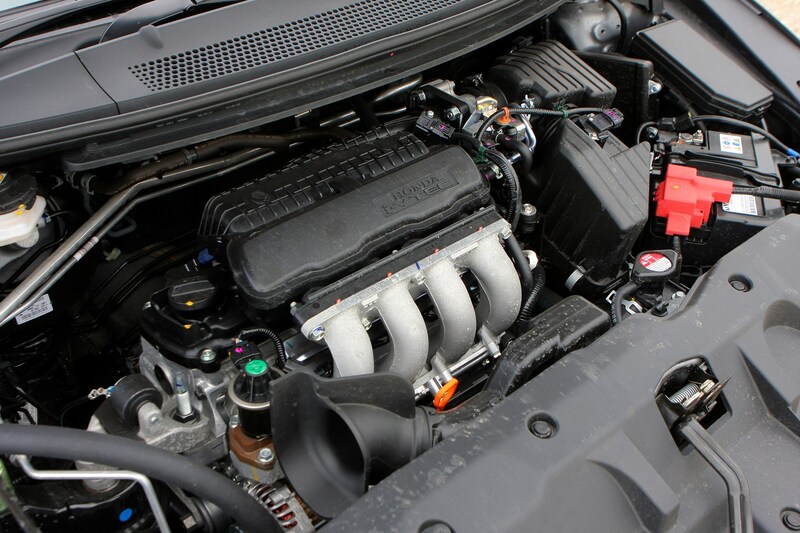 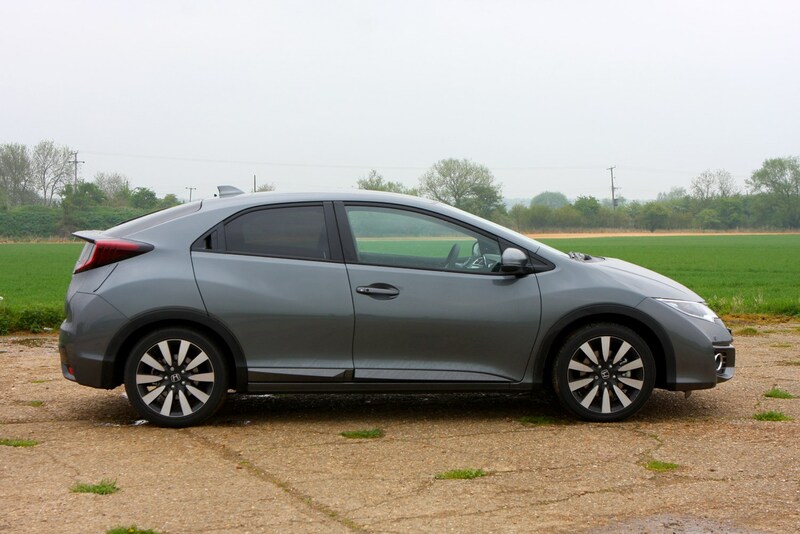 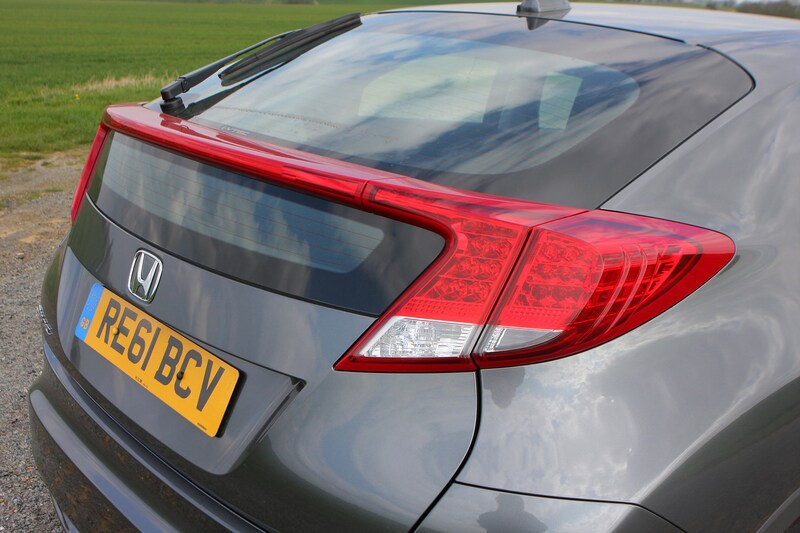 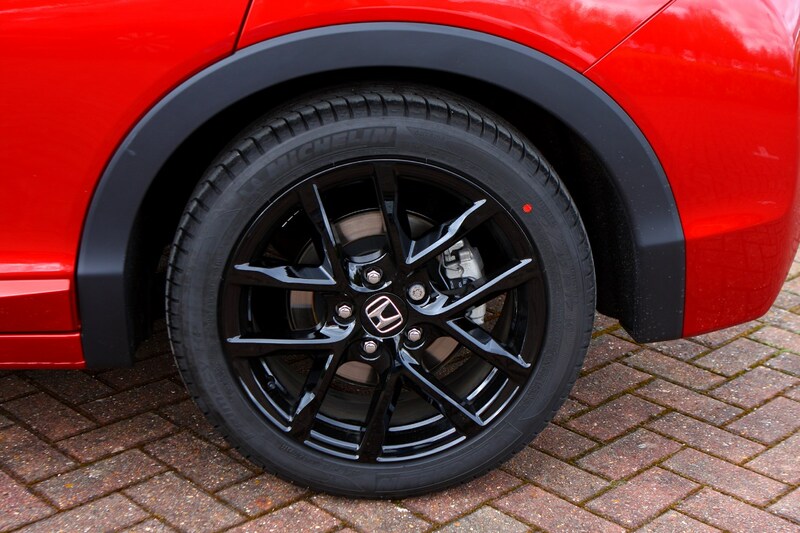 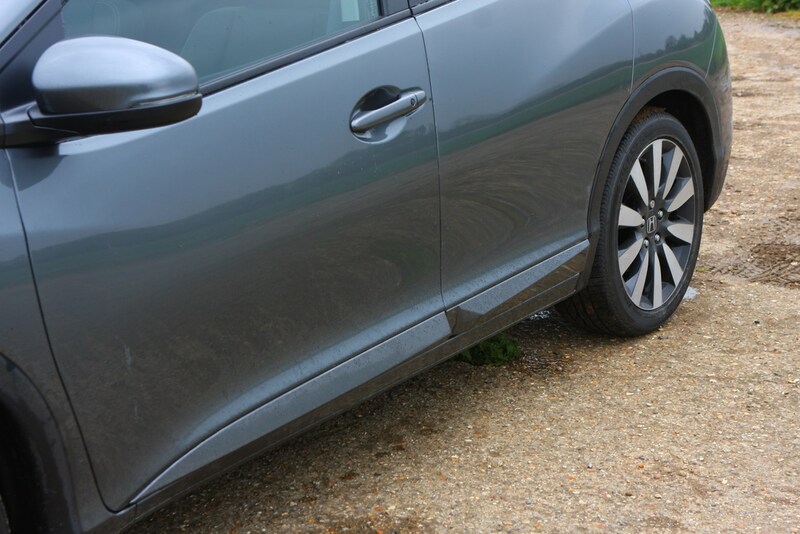 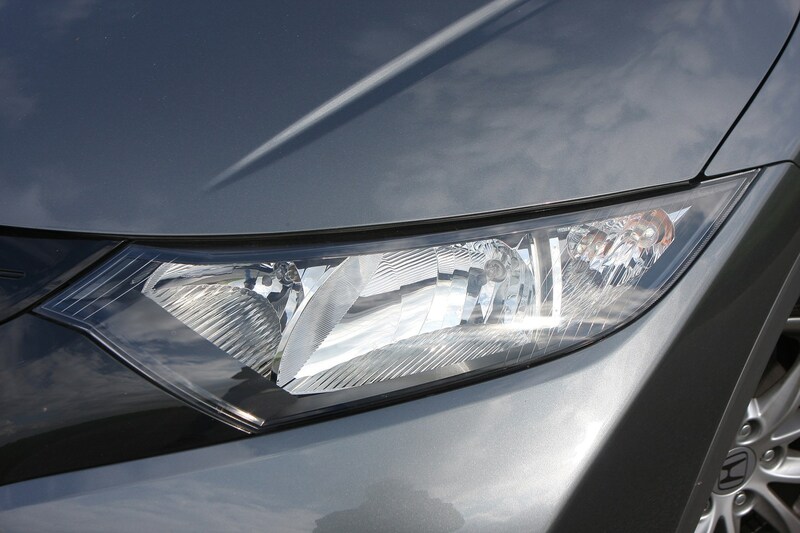 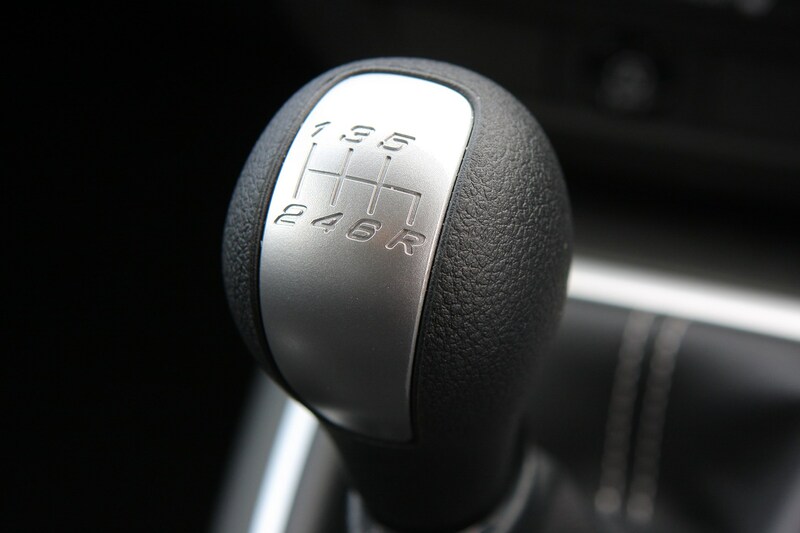 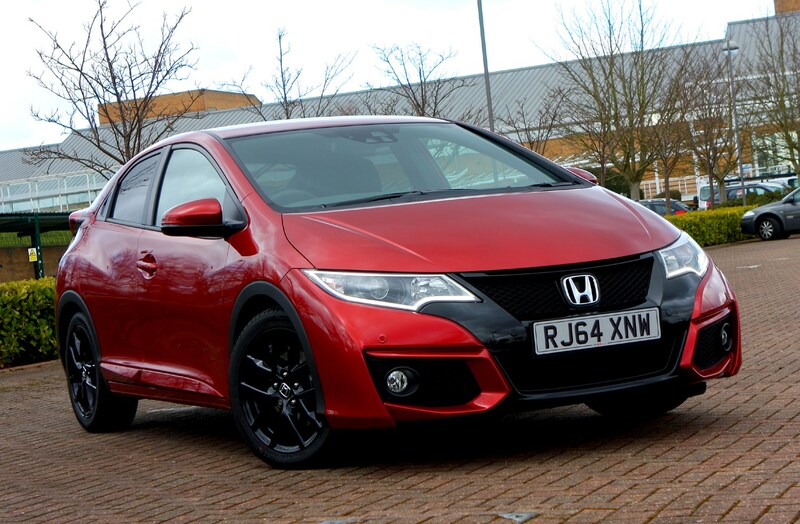 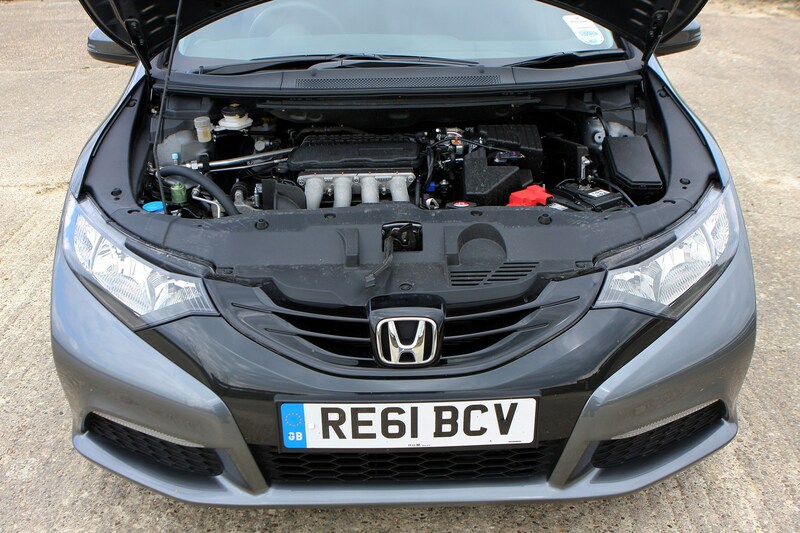 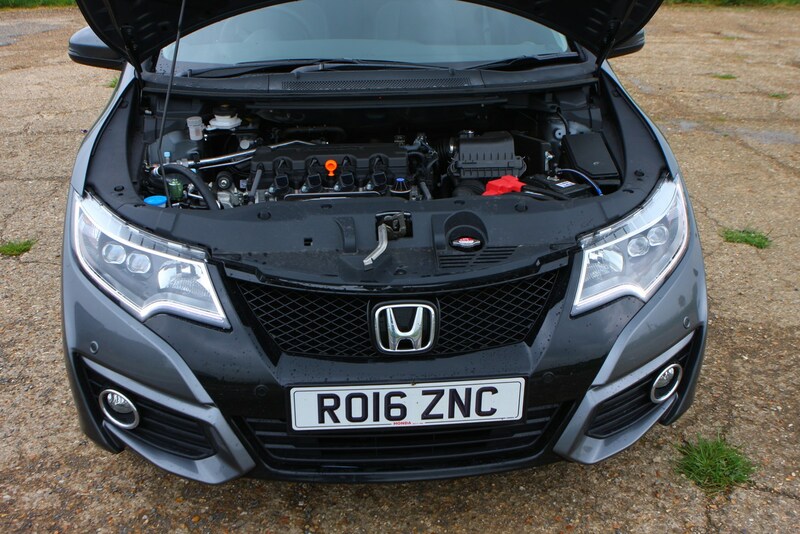 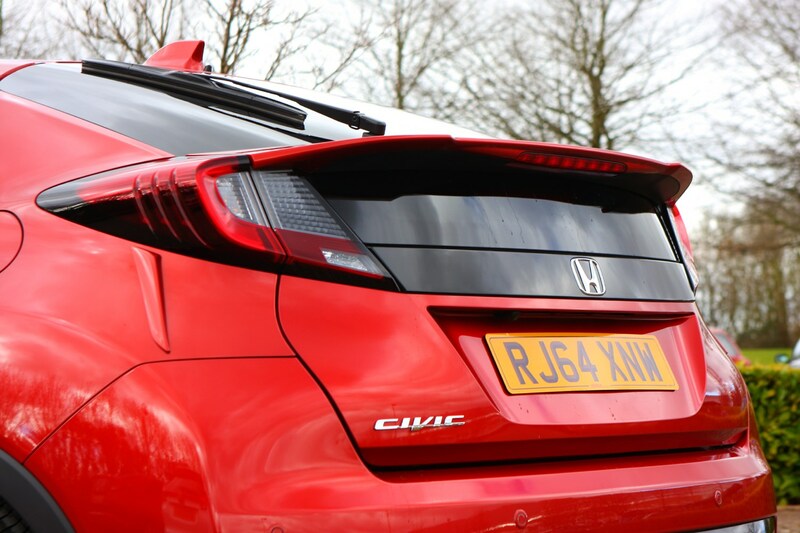 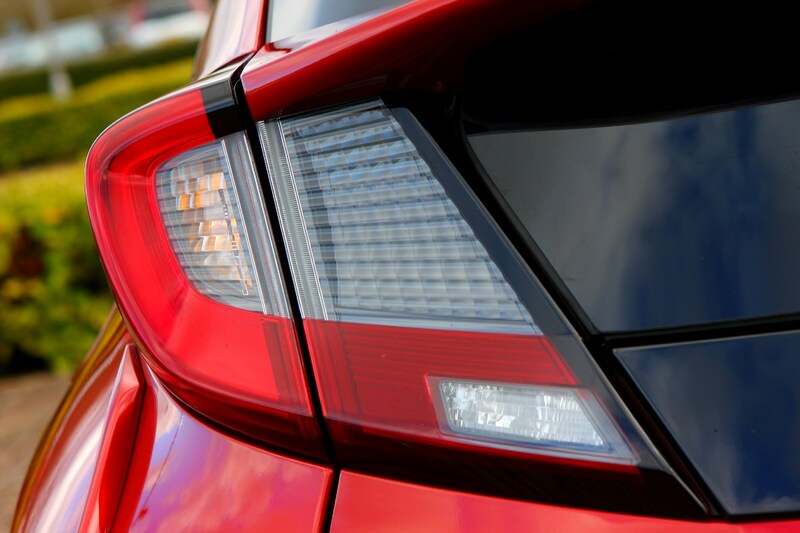 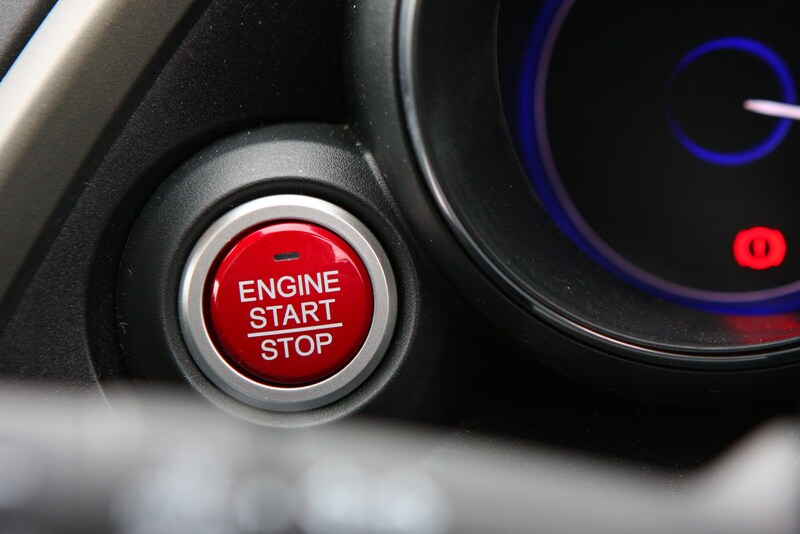 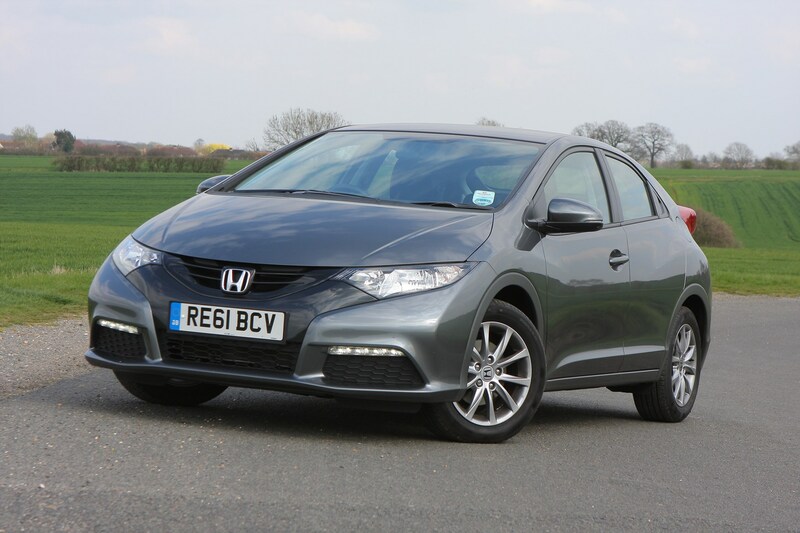 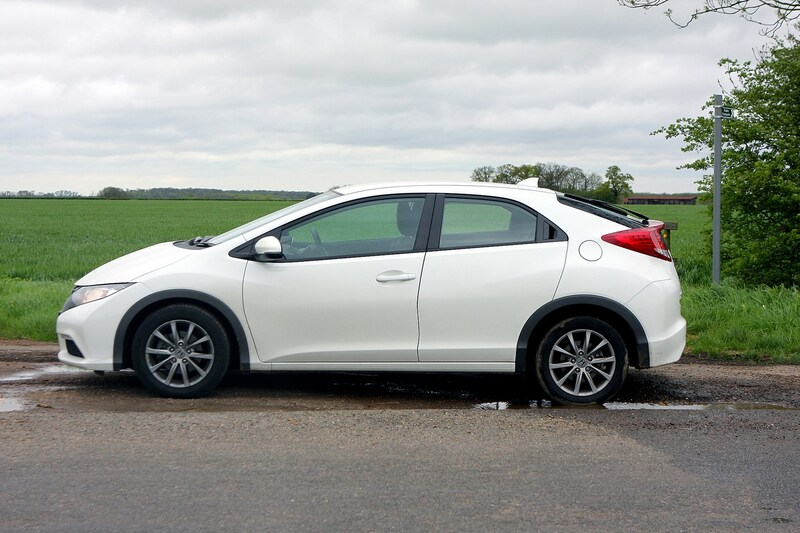 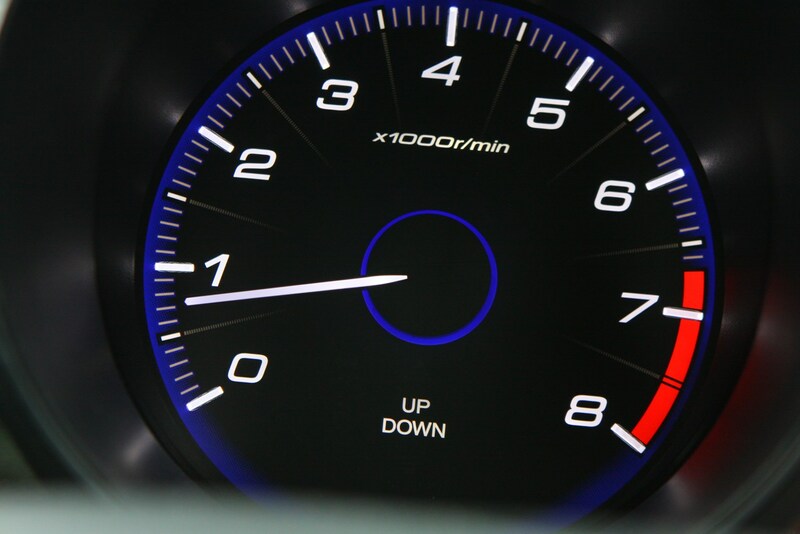 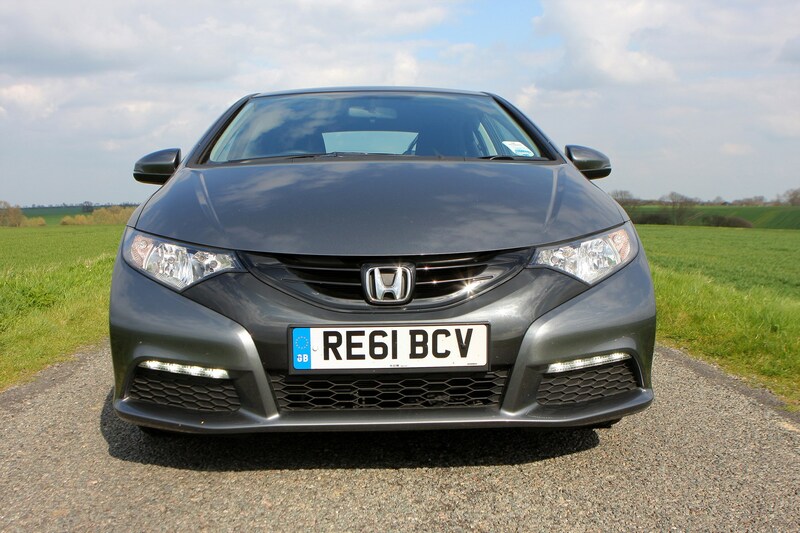 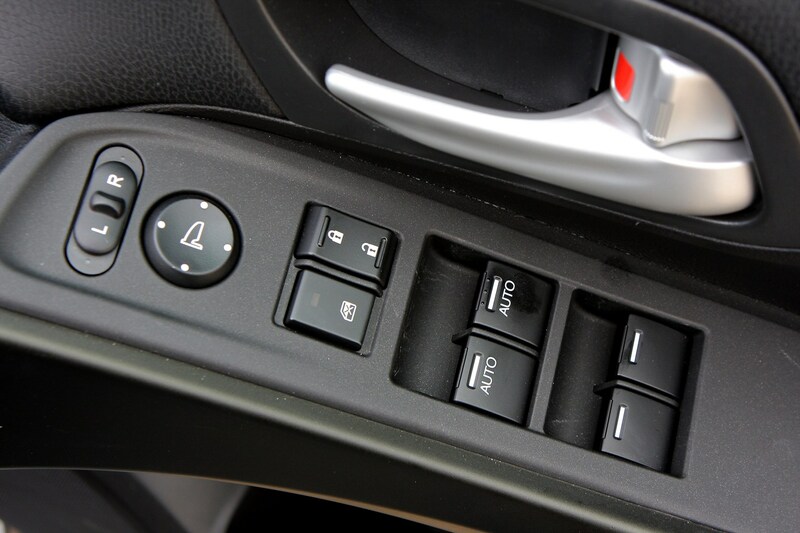 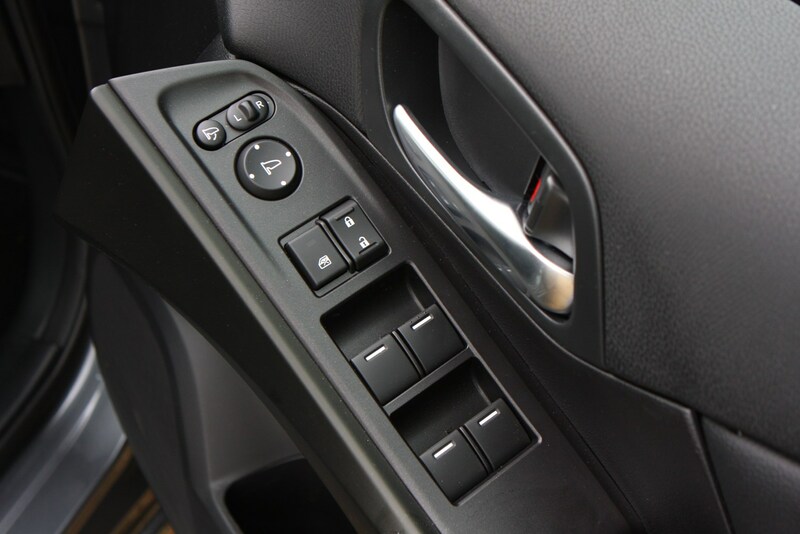 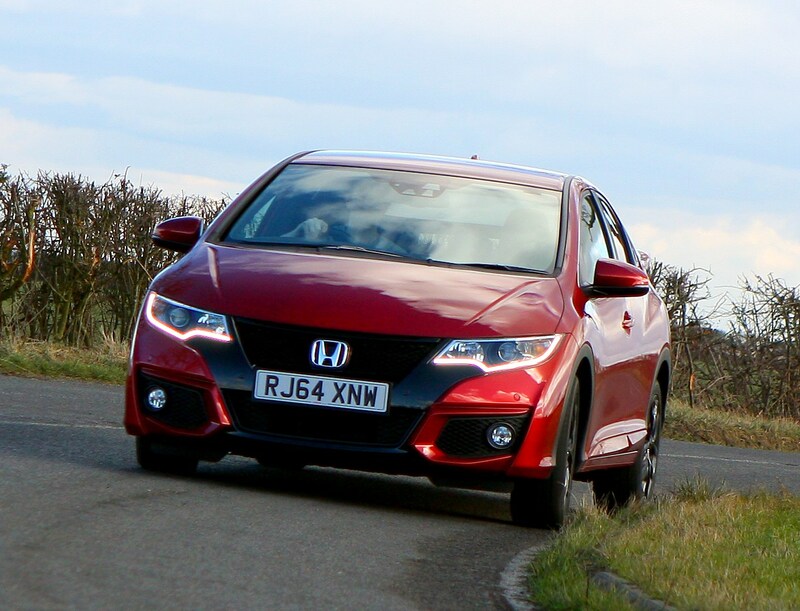 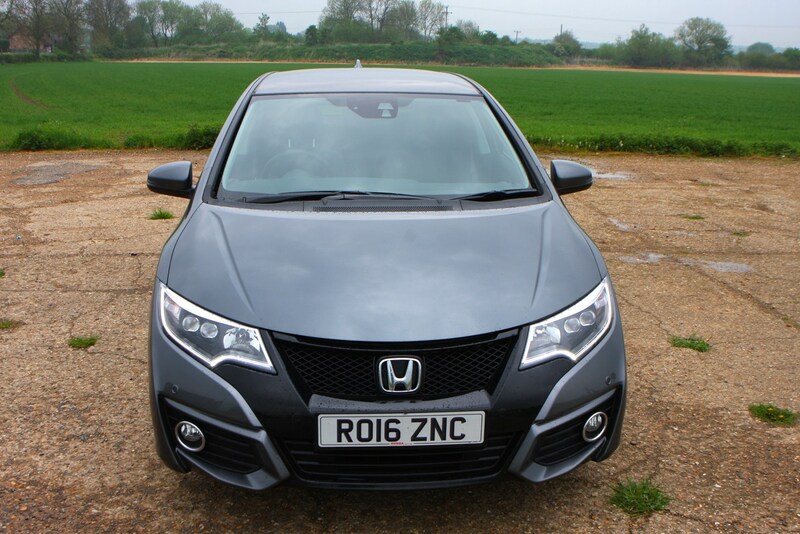 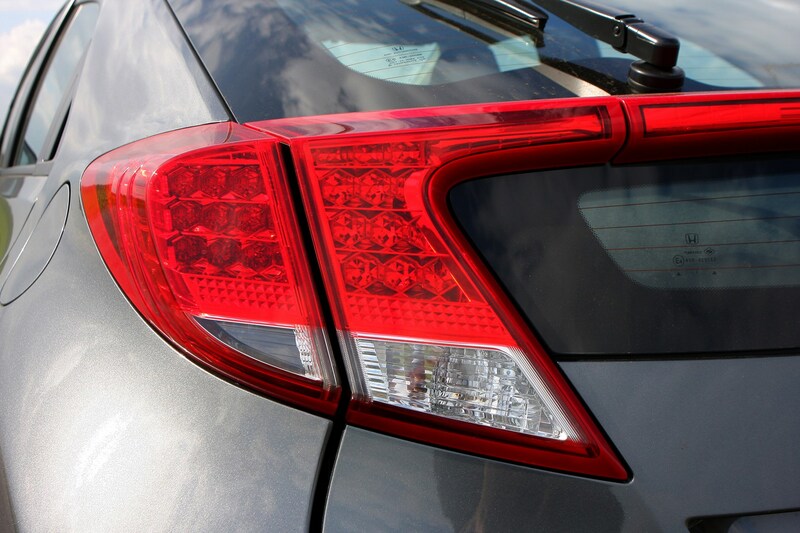 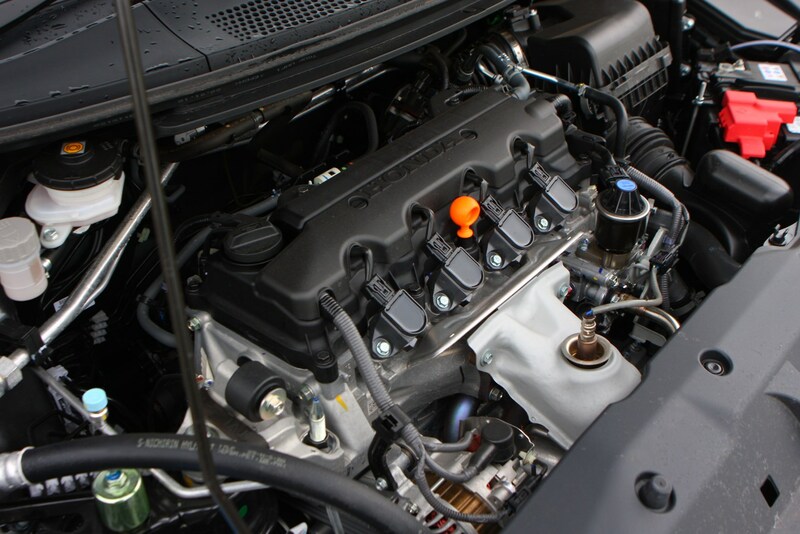 Honda Civic equipment levels are many and varied depending upon which trim you choose, and there has been a line-up change during this car’s lifetime. 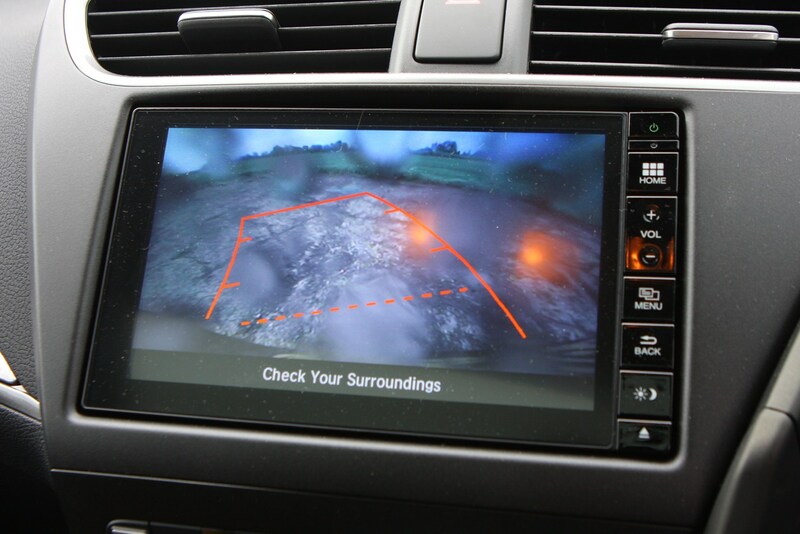 Although the standard equipment offered is reasonable it's pretty much par for the course. 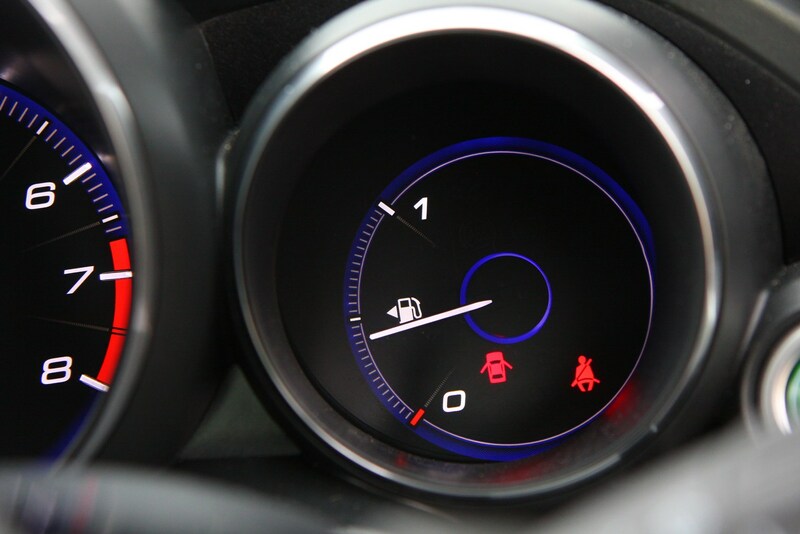 A facelift in 2015 brought the City Brake Active system to the list of standard equipment. 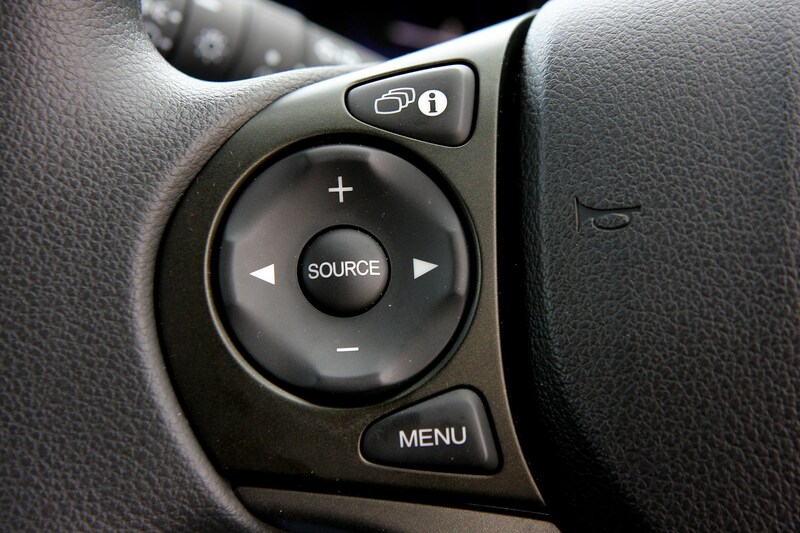 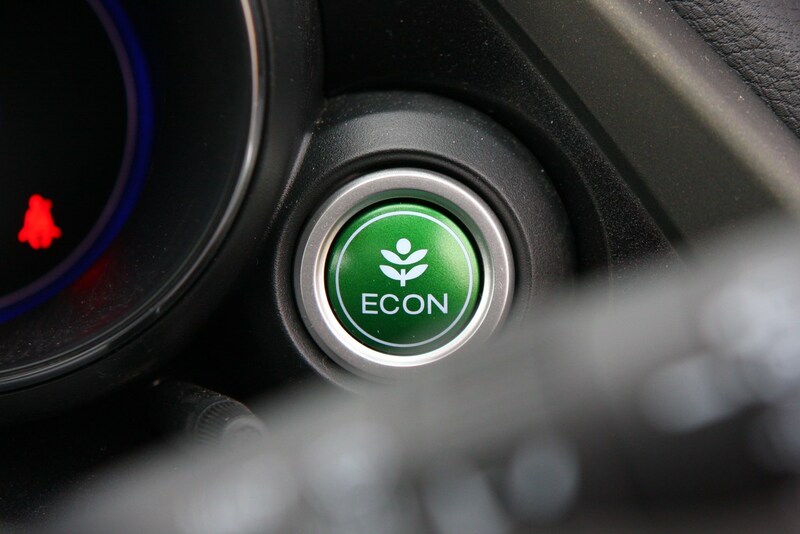 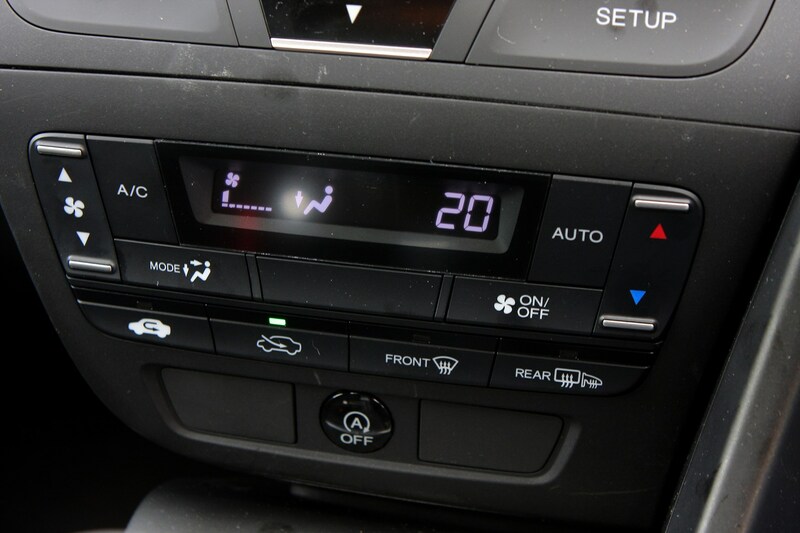 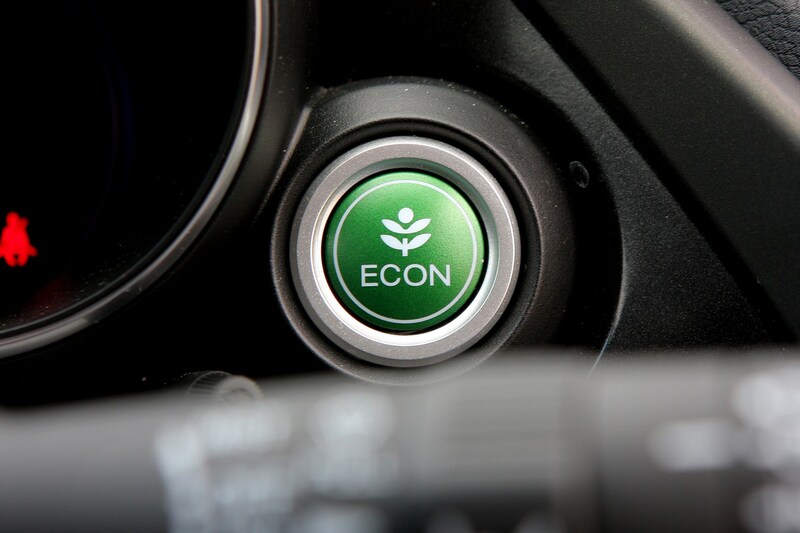 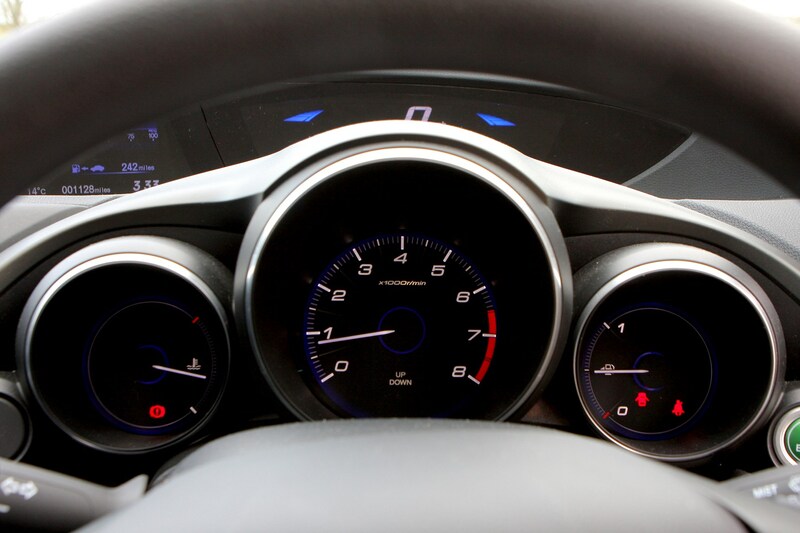 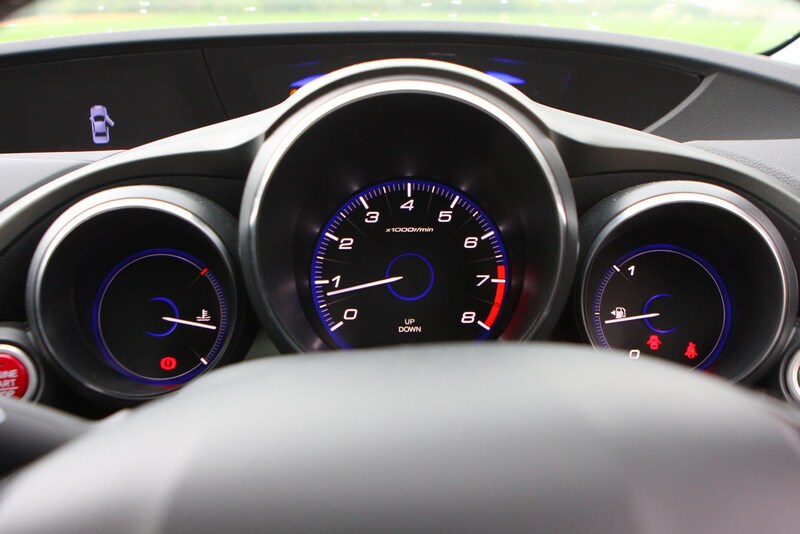 The all-new Honda Connect system with optional sat nav was added to all but base spec cars too. 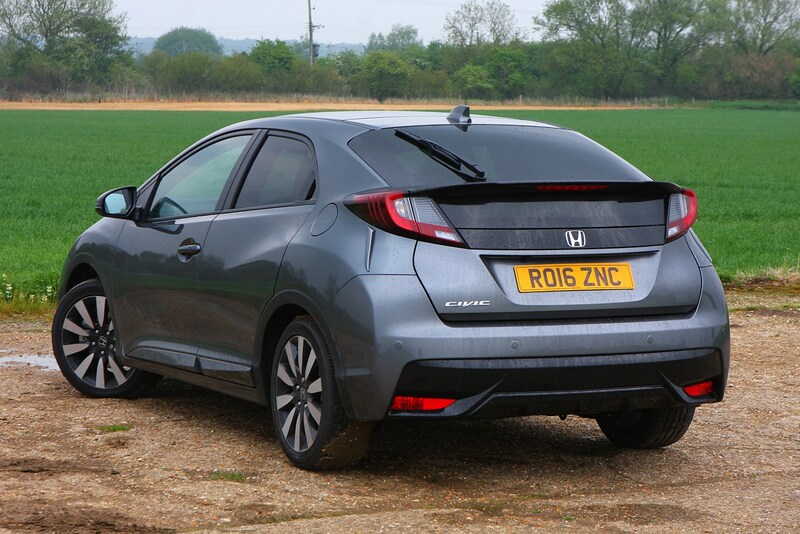 Entry level S models (previously SE) offers 16-inch alloy wheels, LED daytime running lights, climate control, USB/AUX Jack (iPod compatible), one touch Magic Seats, power windows and heated power mirrors, alarm, immobiliser, deflation warning system, hill start assist and vehicle stability assist. 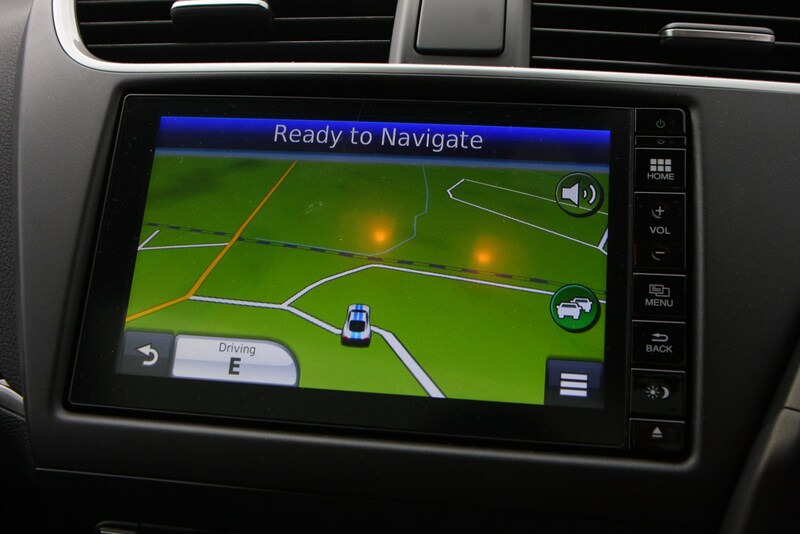 SE-T trim (no longer available) got you a sat nav system with Bluetooth handsfree connectivity. 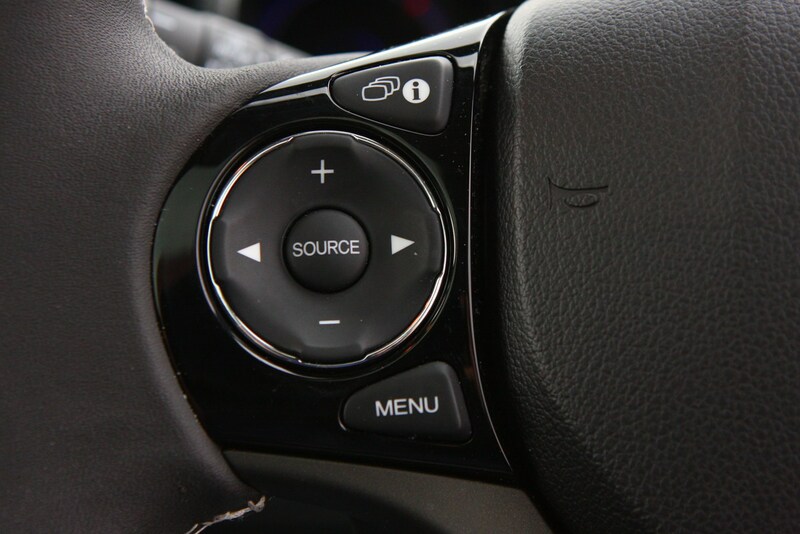 Go for the SE Plus (previously ES) which incorporates features found in the S grade but adds a leather steering wheel and gear stick, rear parking camera plus sensors front and rear, cruise control with speed limiter, dual zone climate control, and remote retractable door mirrors. 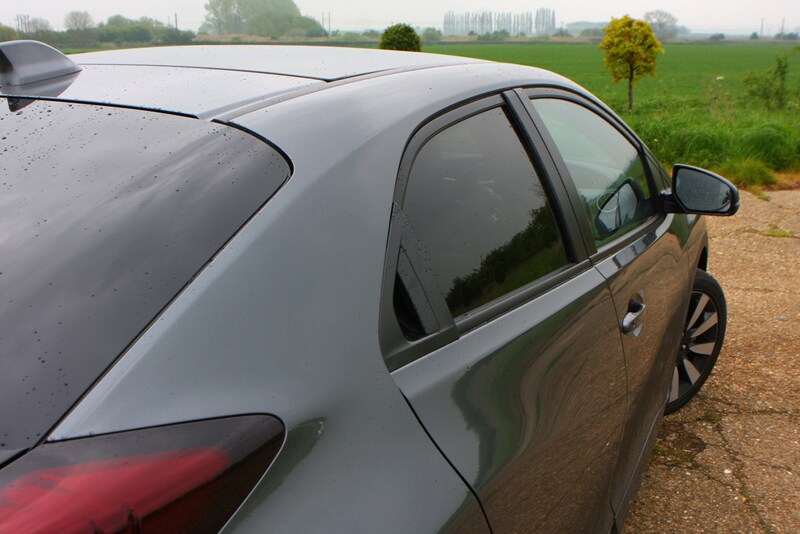 In 2014 theSport derivative was added, which gains a colour-coded rear spoiler and unique 17-inch alloy wheels, as well as a new front bumper with mesh grille and a black roof lining inside. 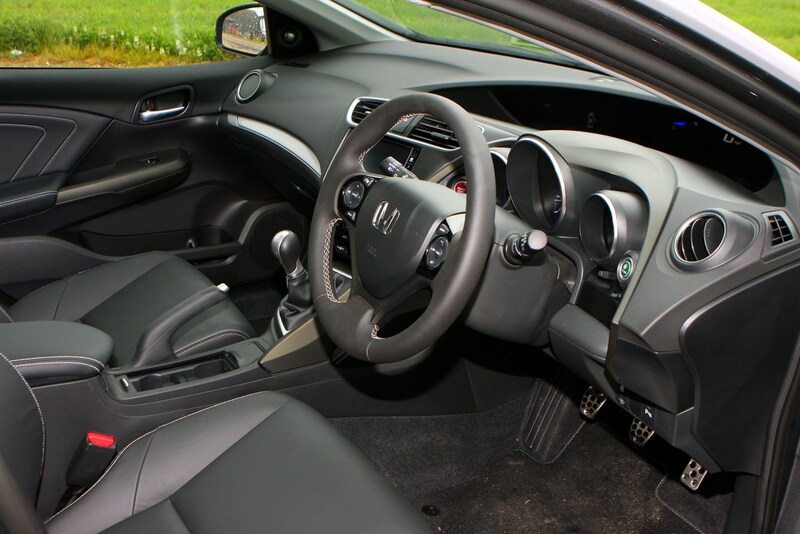 SR (previously ES-T) is the same as SE Plus but with leather interior, alloy pedals, heated front seats, glass roof, auto dim rear view mirror, driver seat power lumbar adjust and high power audio with eight speakers. 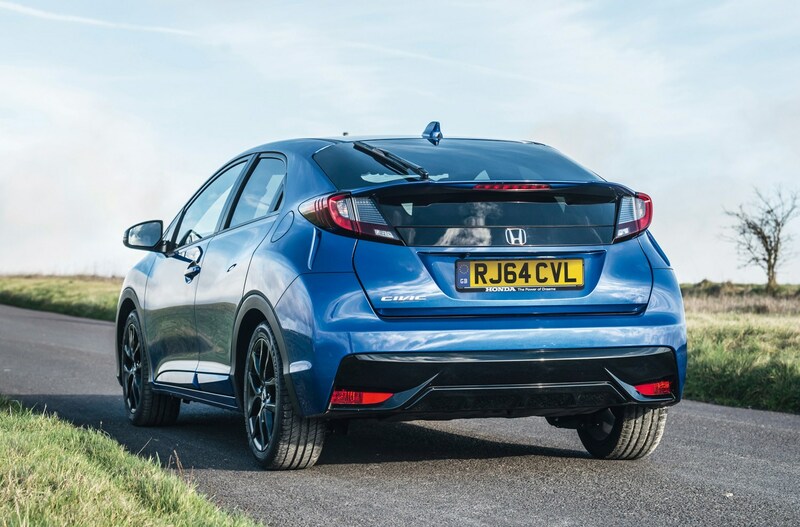 The EX Plus (previously EX GT) tops the range with smart entry and start, passenger seat power lumbar adjust, driver seat power adjustable side support, interior ambient lighting, 17 inch alloy wheels and LED headlights. 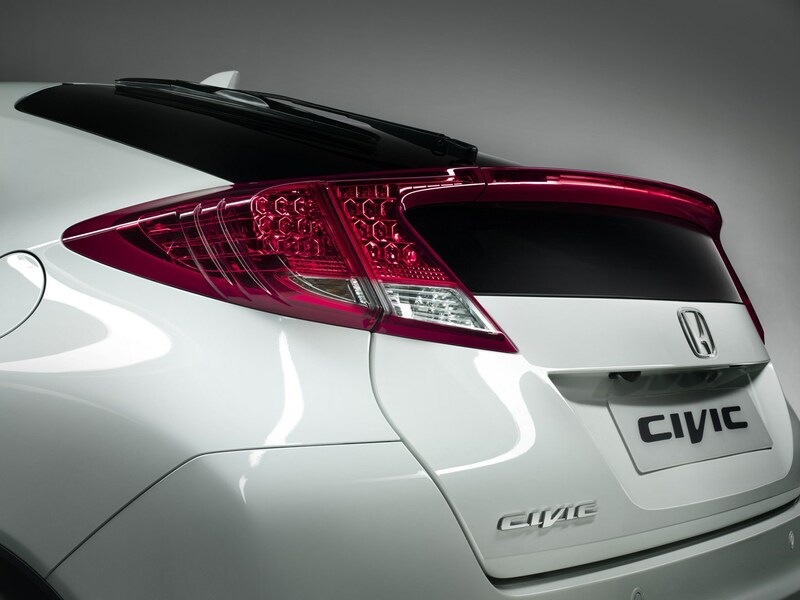 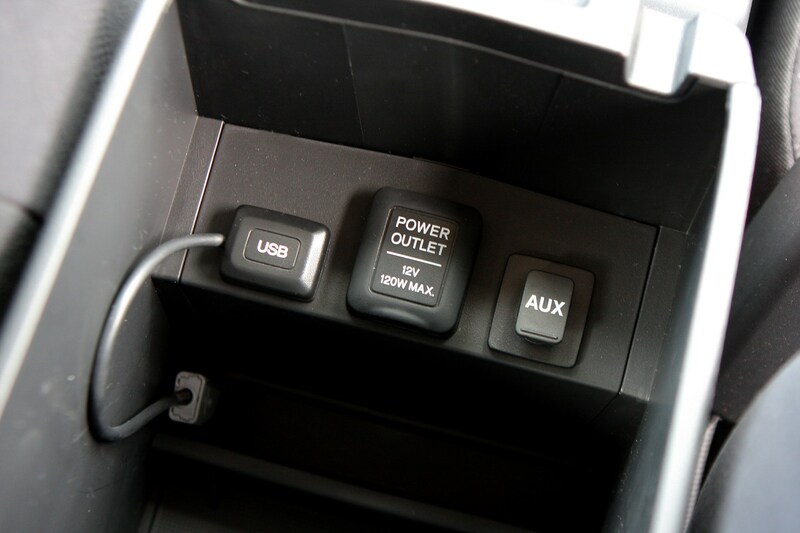 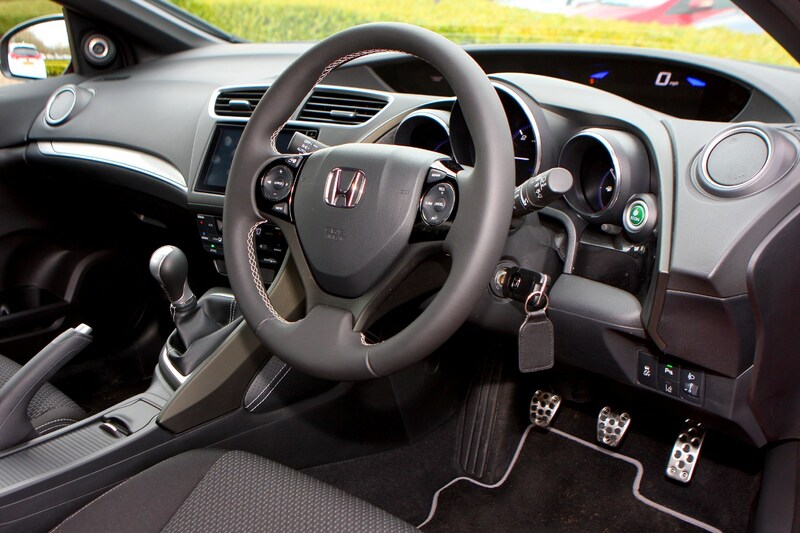 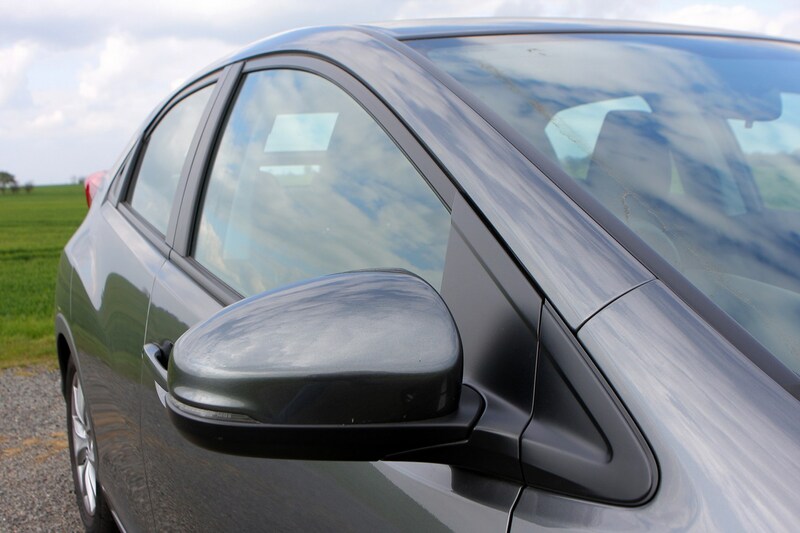 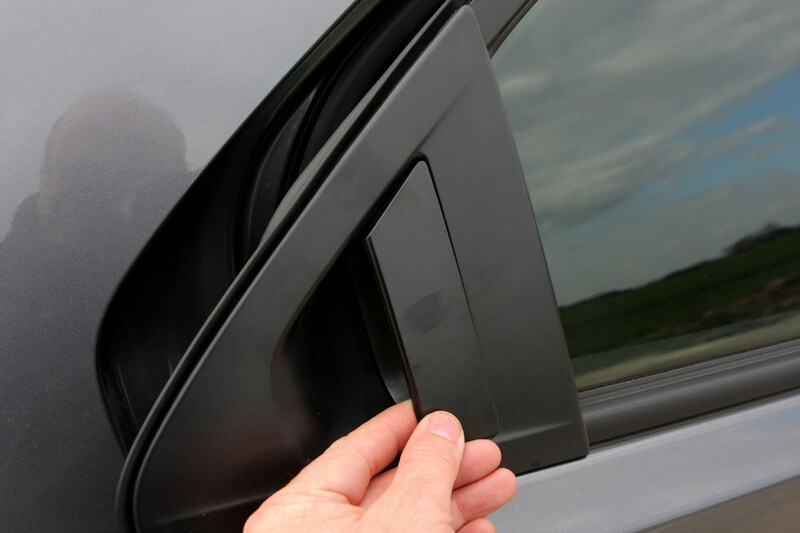 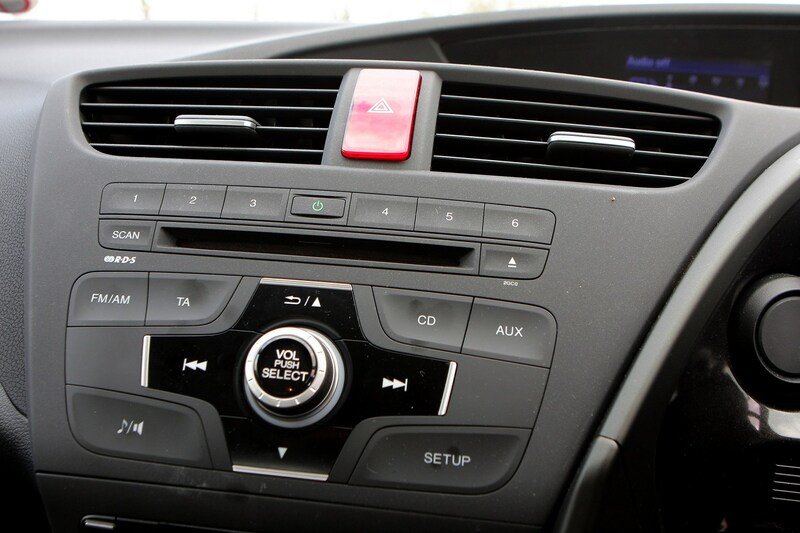 Honda Civic accessories are grouped into packs. 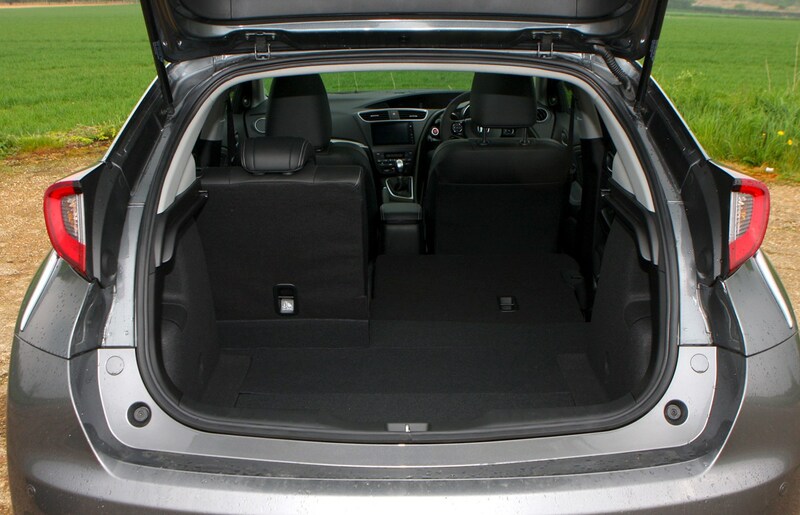 The Premium Pack includes doorstep garnishes, front and rear mudguards, elegance floor carpets and a boot tray. 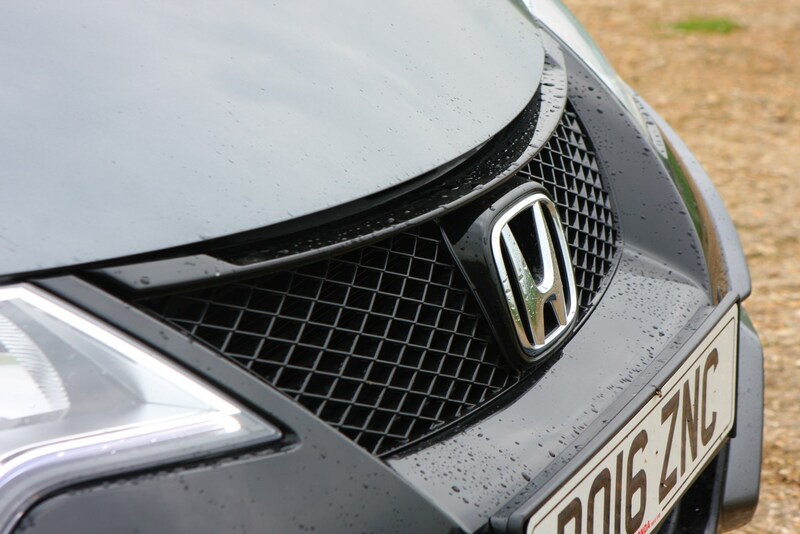 The Chrome Pack includes front grille garnish, window decorations, side body trim decorations, rear skirt garnish and a sports tank lid. 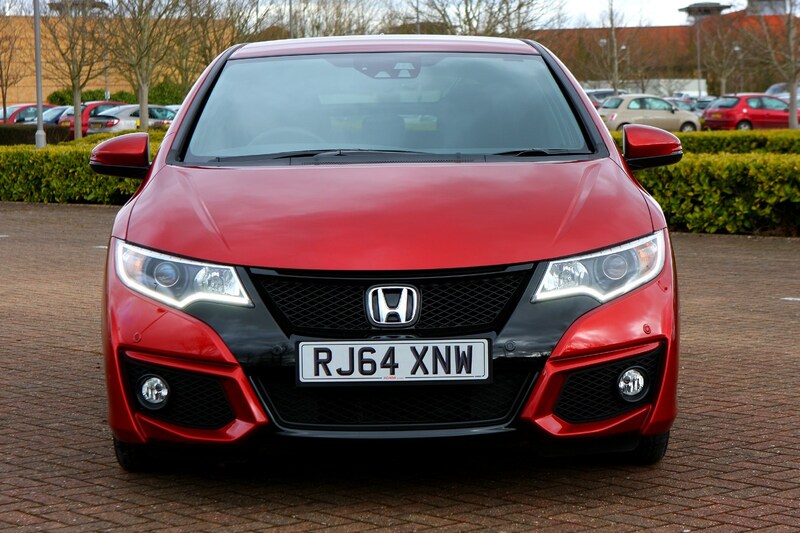 The Rally Red Exterior Pack adds red highlights to the front grille, door mirrors, rear bumper and spoiler. 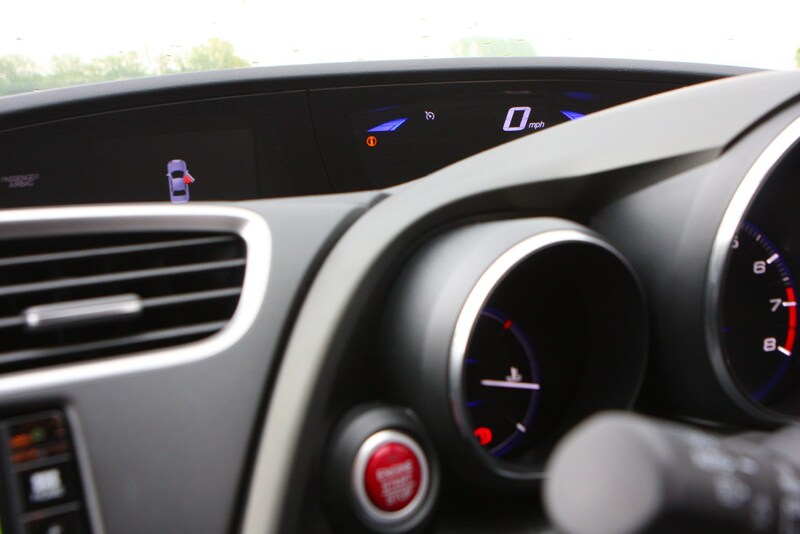 The Rally Red and Shiny Black Interior packs do the same in different colours to the air vents, centre console and steering wheel. 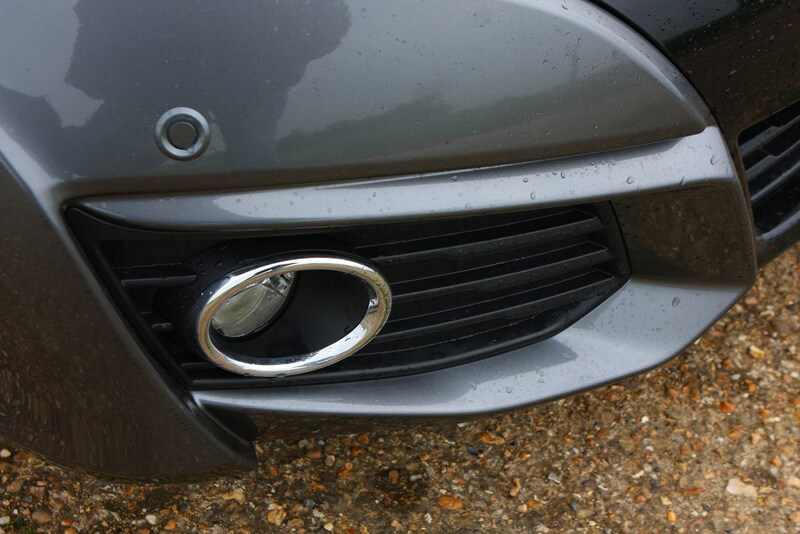 Finally the Illumination Pack means you get lights under the doorstep garnishes and in the footwells. 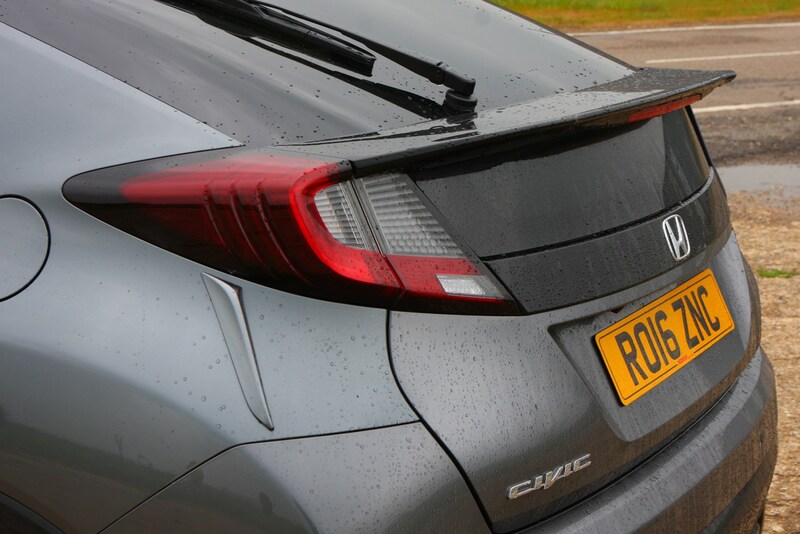 It’s up to you which of these packs you buy, but don’t forget you may be able to haggle one into the price of your car if you ask the dealer especially nicely. 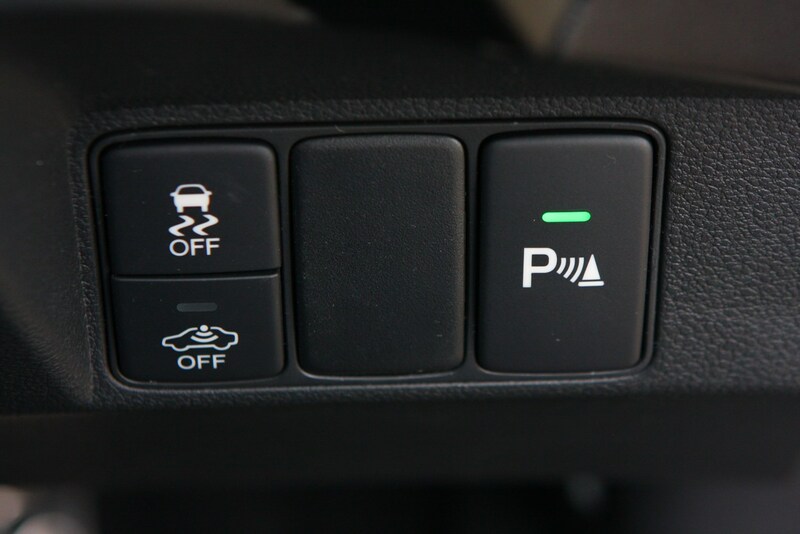 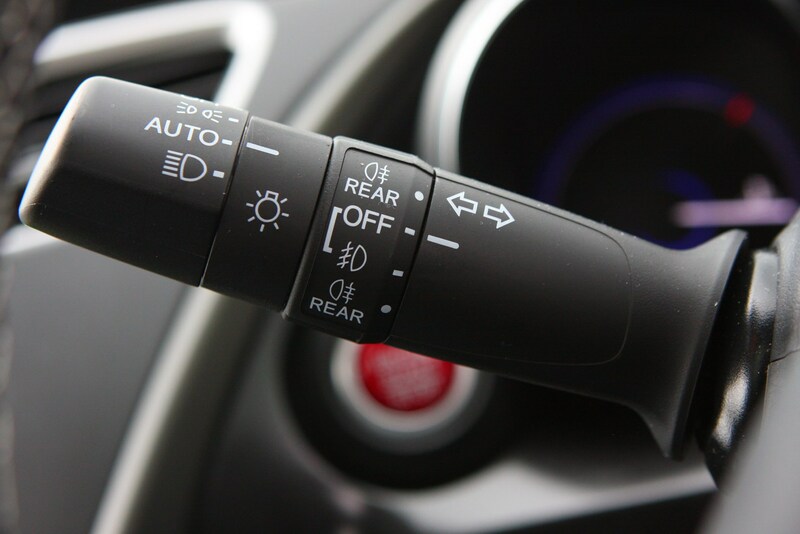 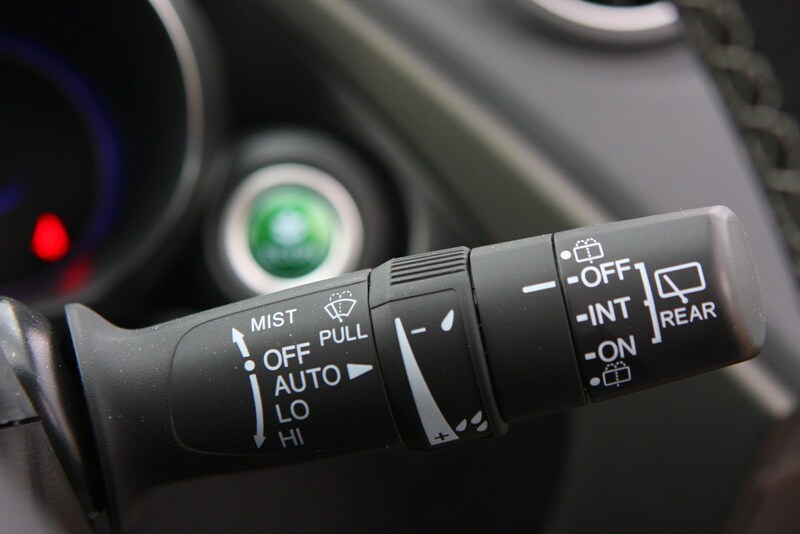 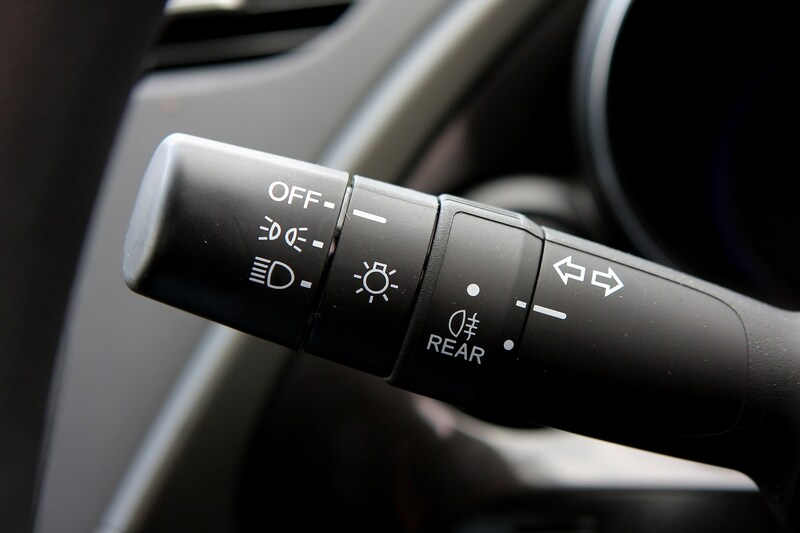 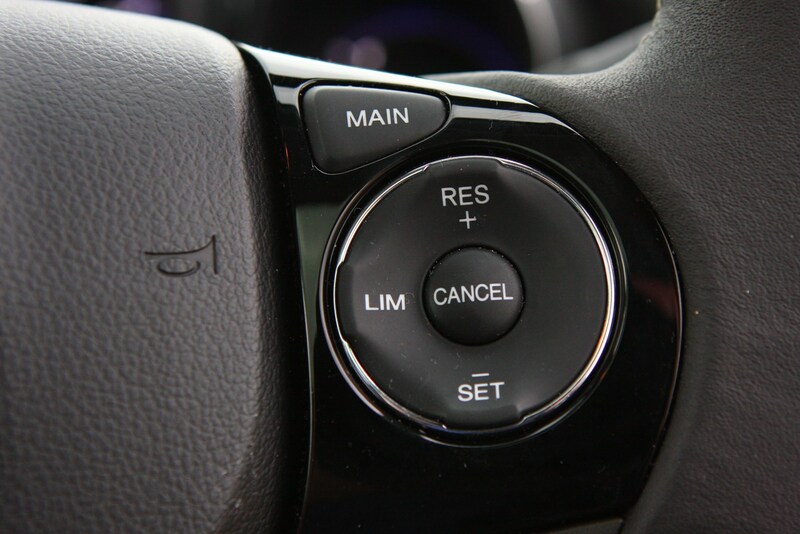 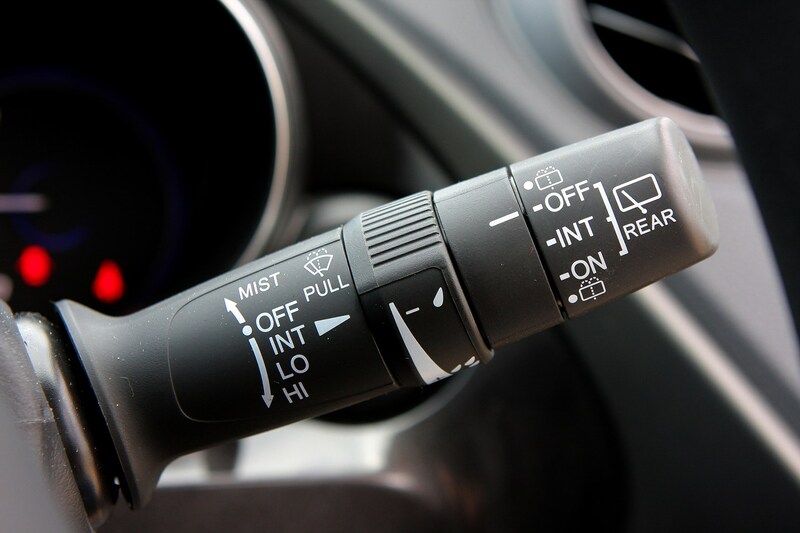 You can specify adaptive cruise control and collision mitigation - a system that applies the brakes if it thinks a collision is imminent. 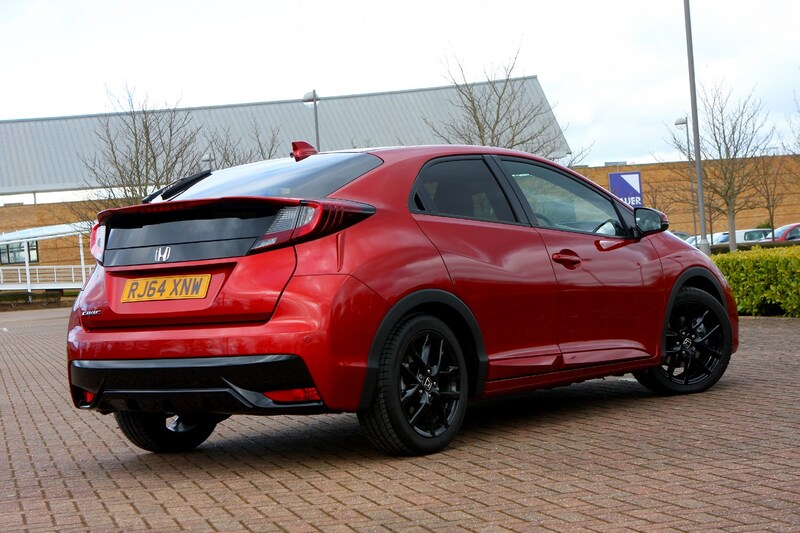 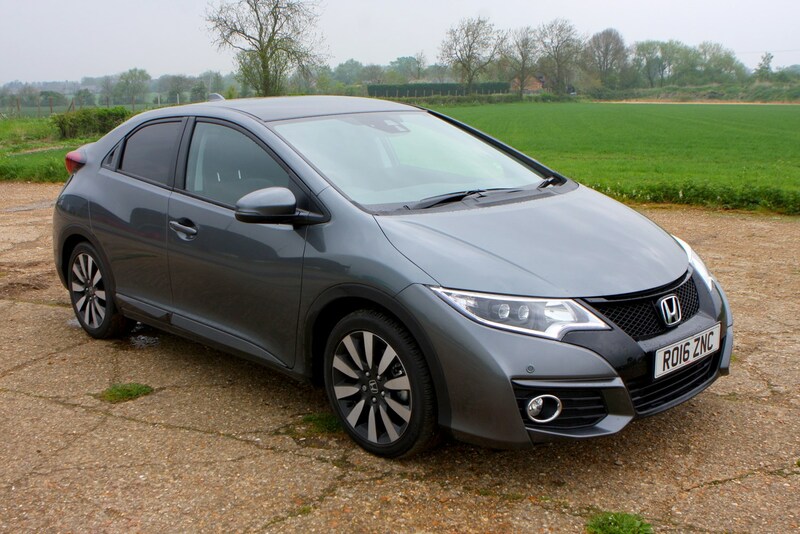 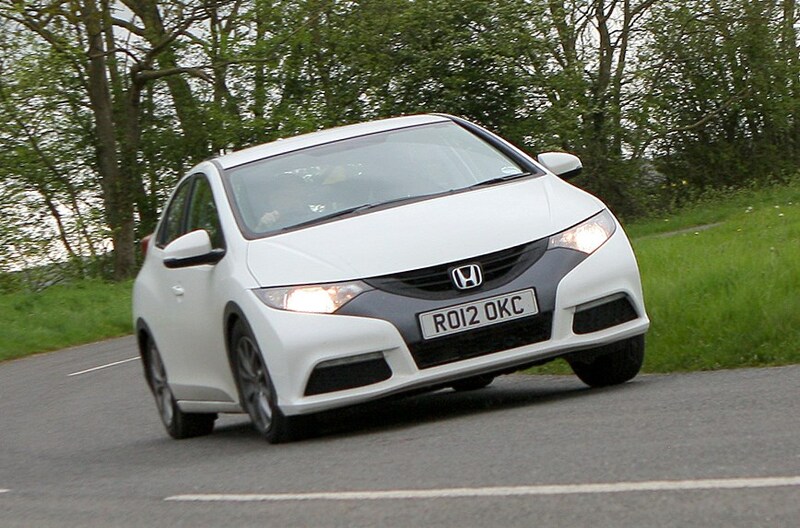 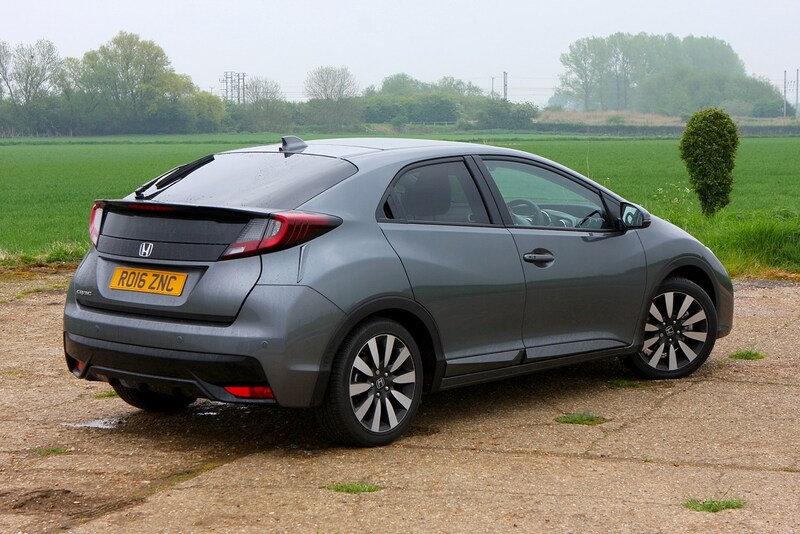 Honda has also included pedestrian protection that features windscreen wiper pivots designed to break away on impact and energy absorbing front wing mounts. 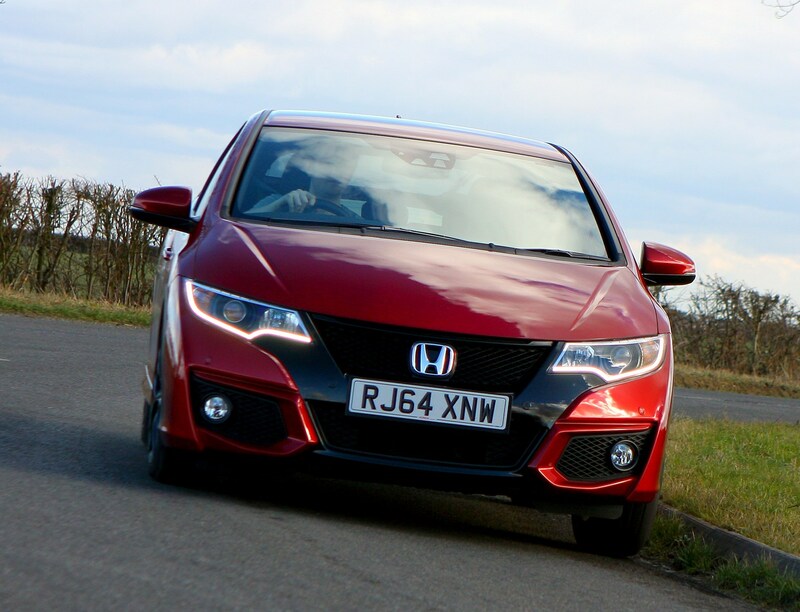 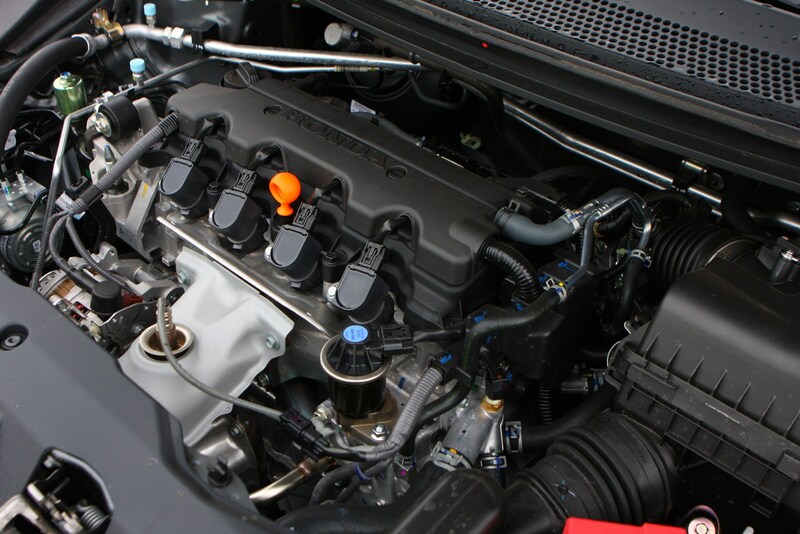 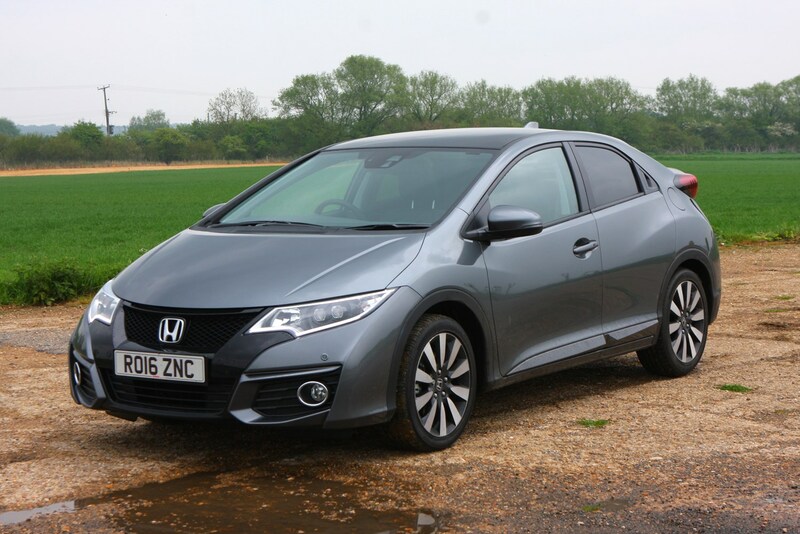 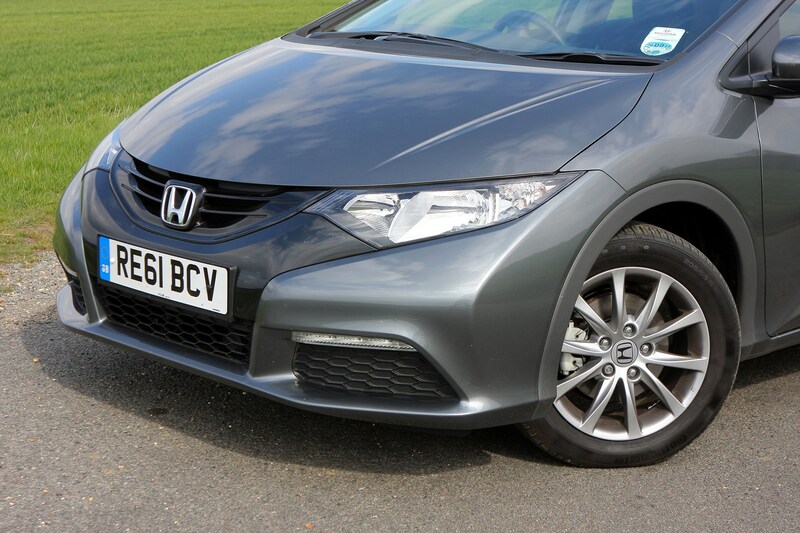 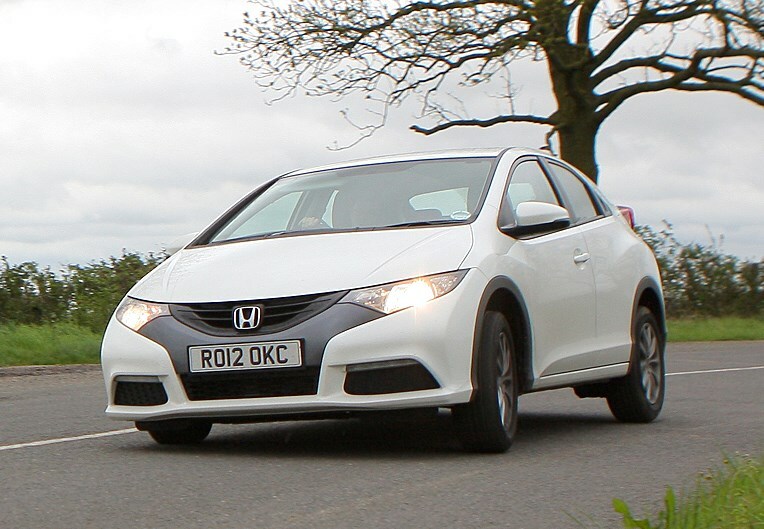 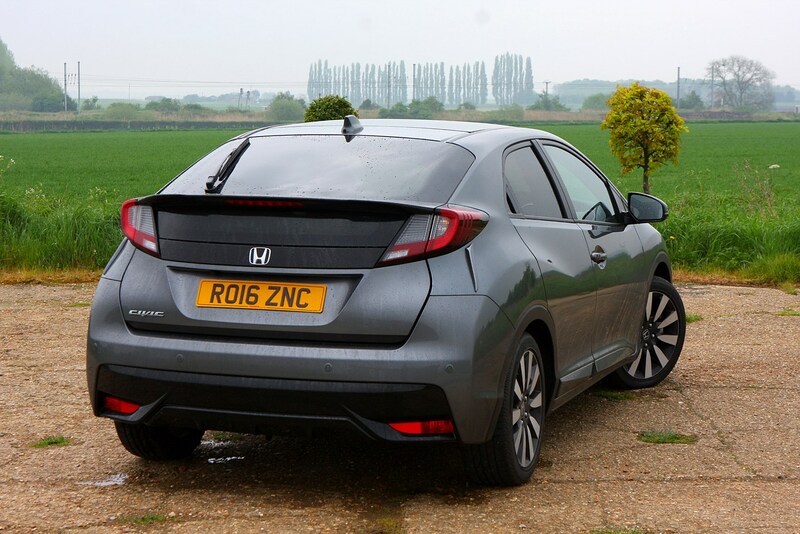 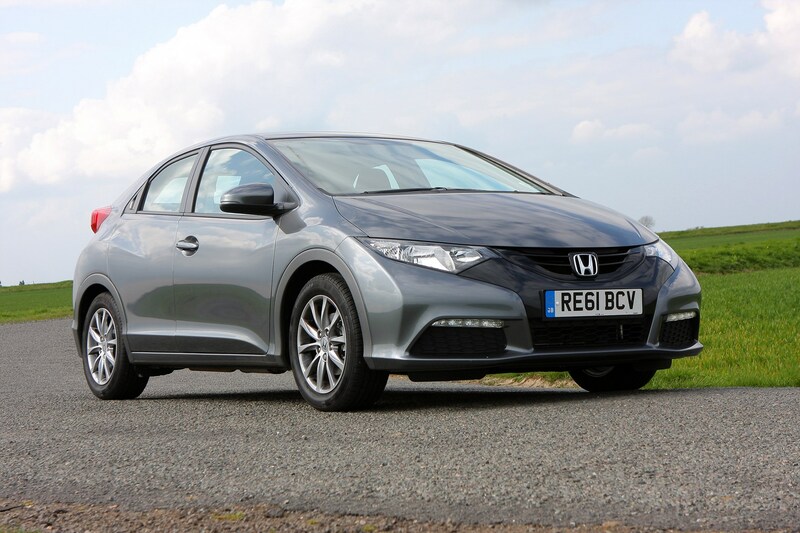 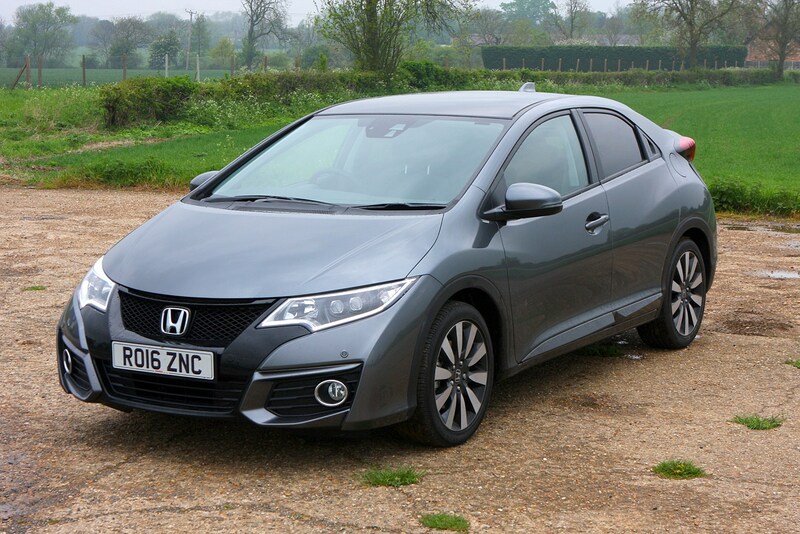 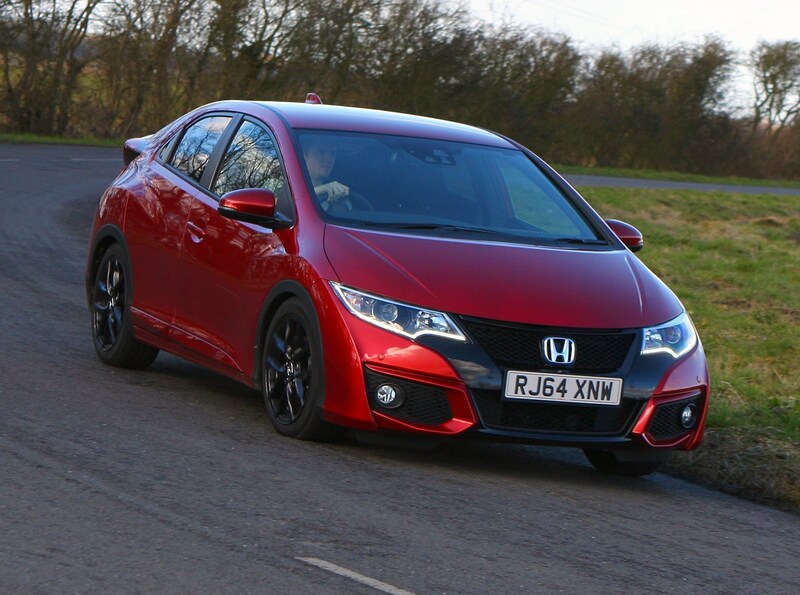 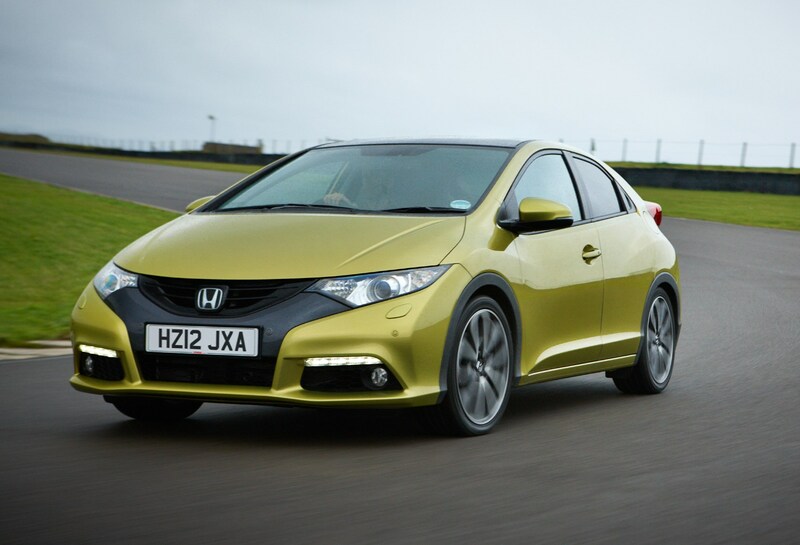 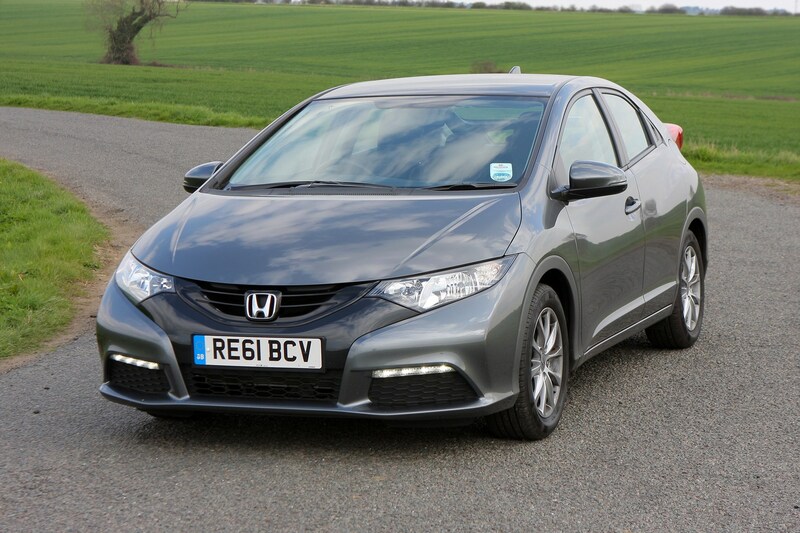 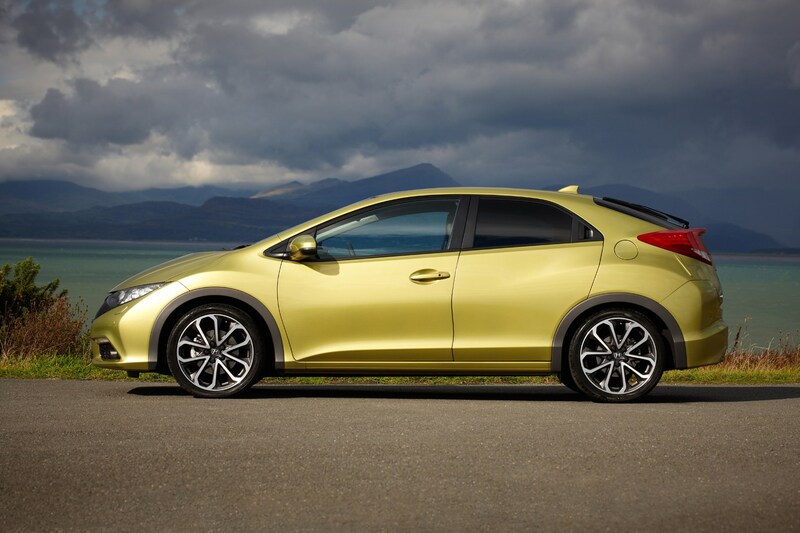 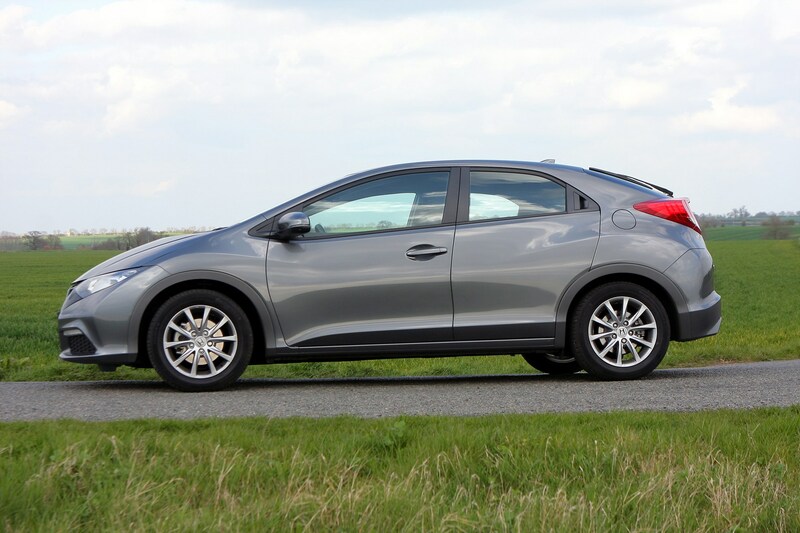 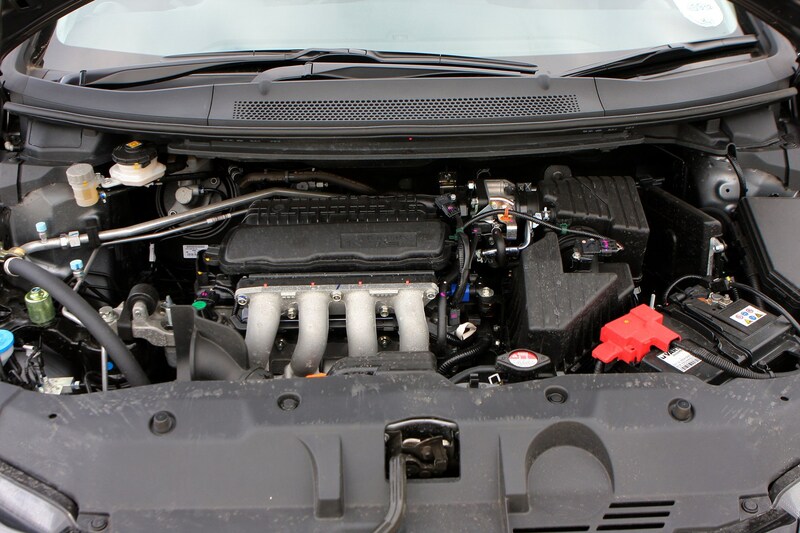 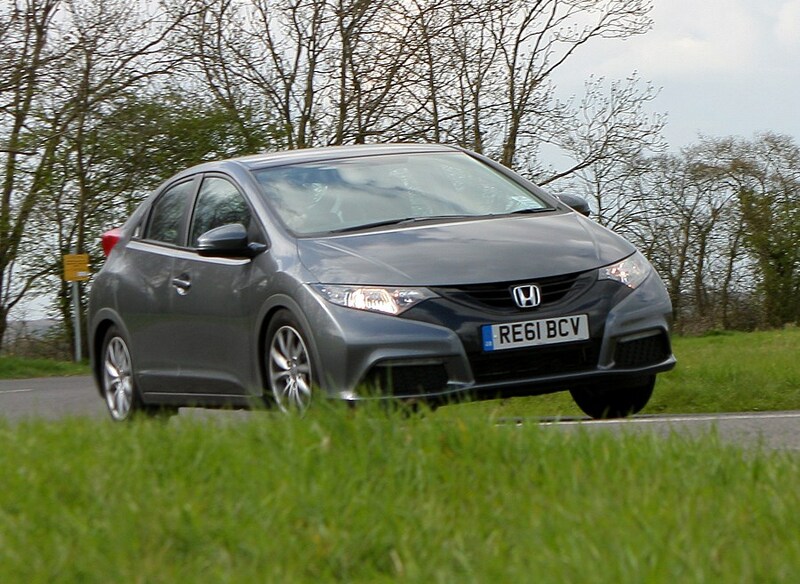 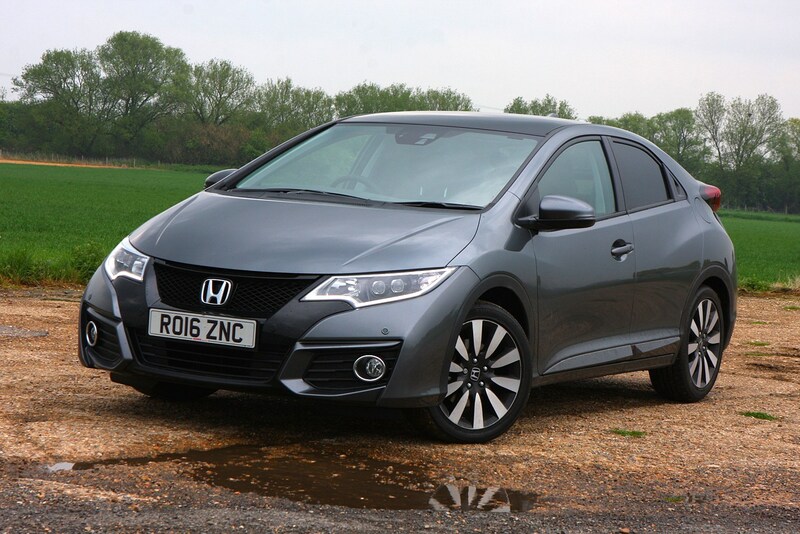 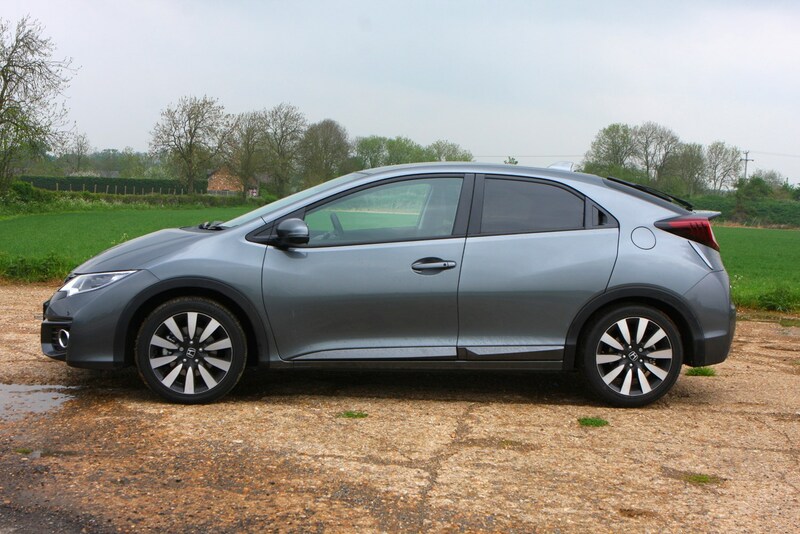 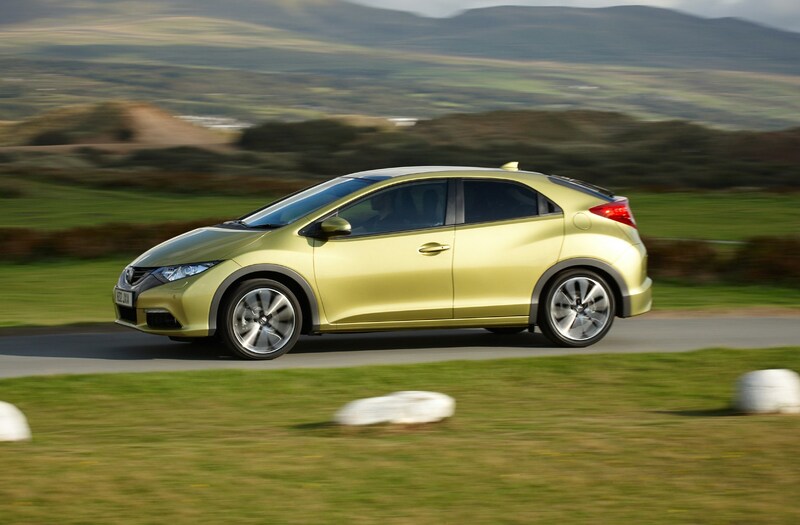 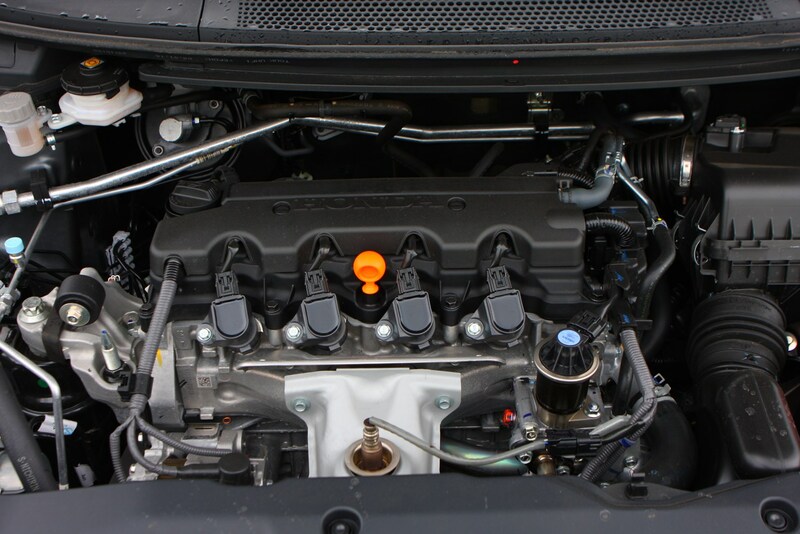 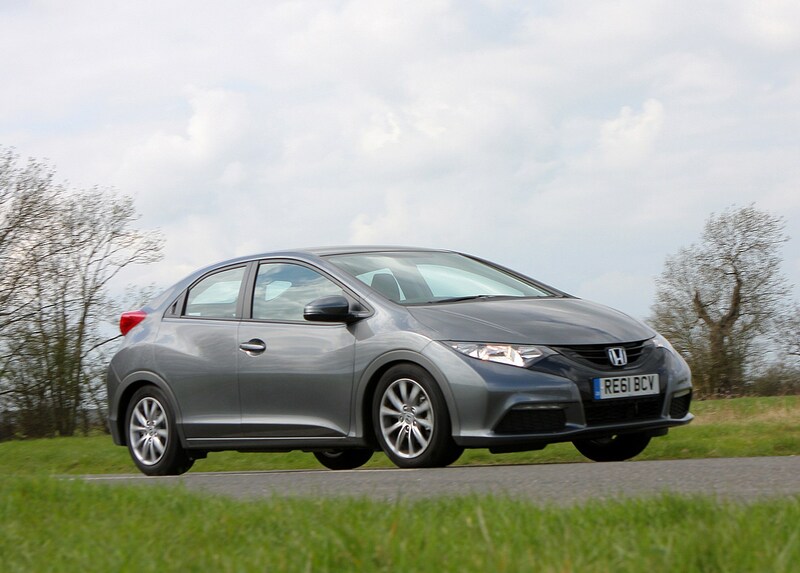 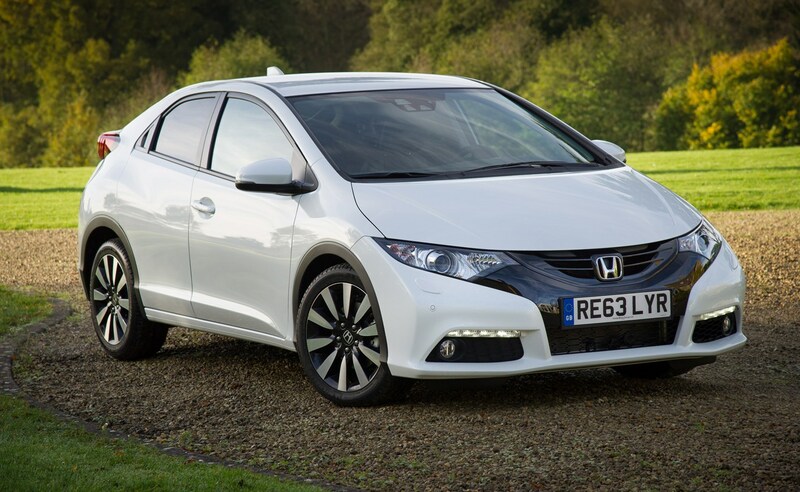 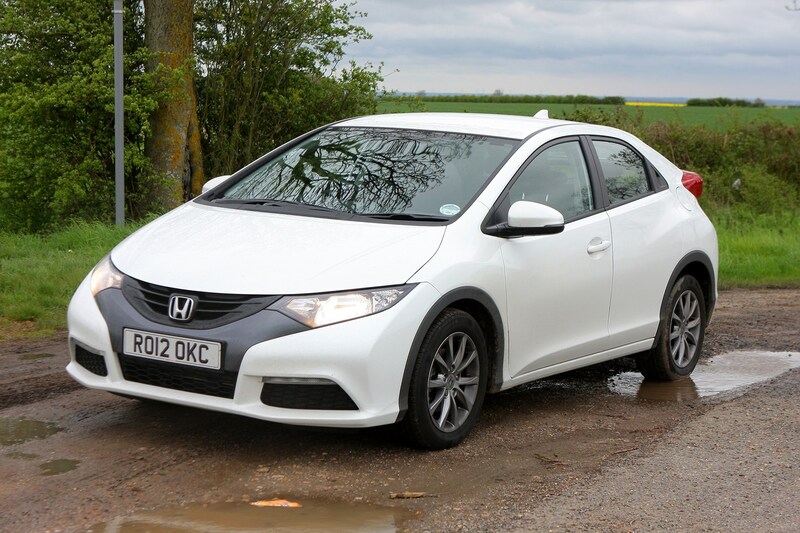 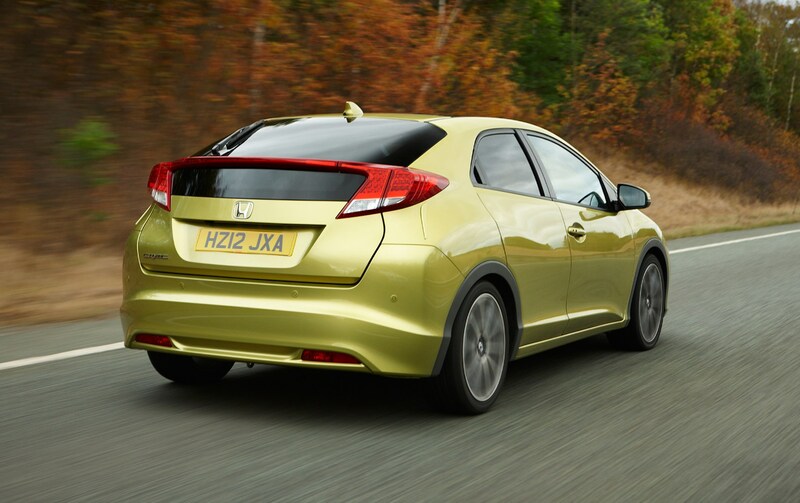 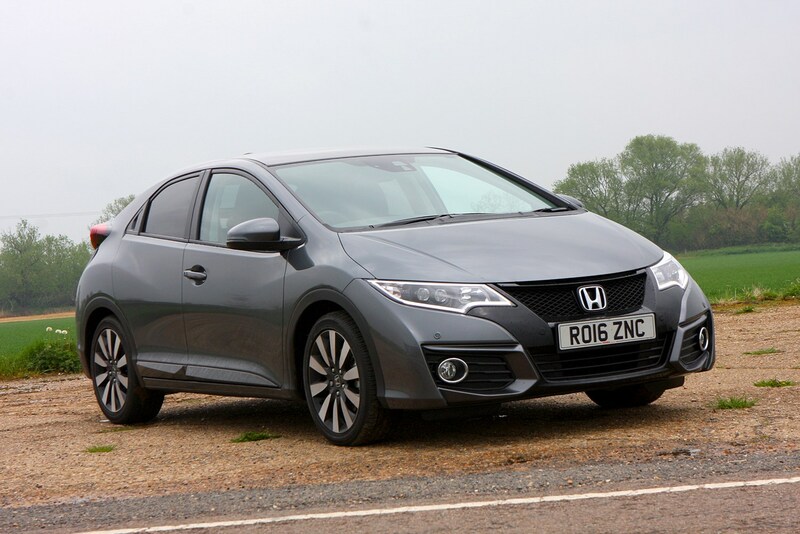 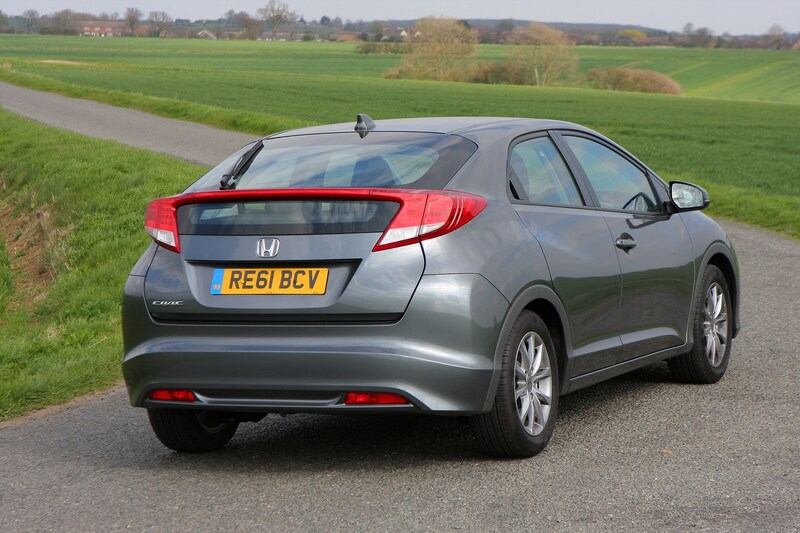 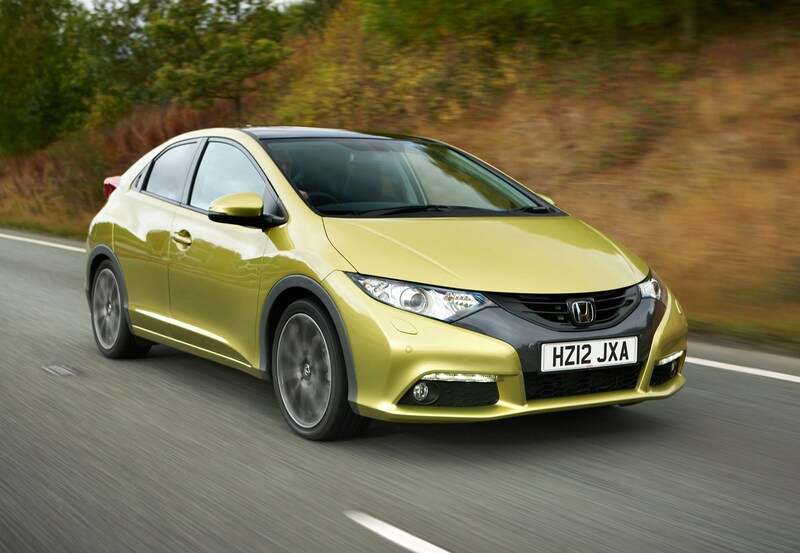 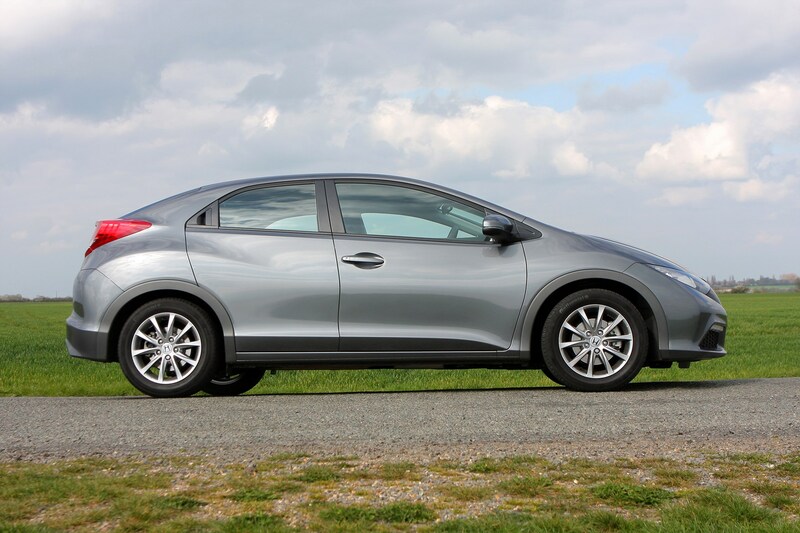 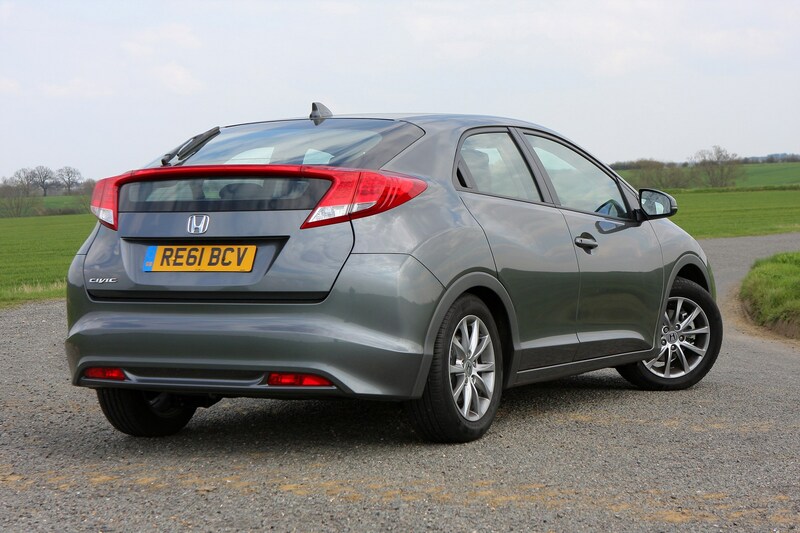 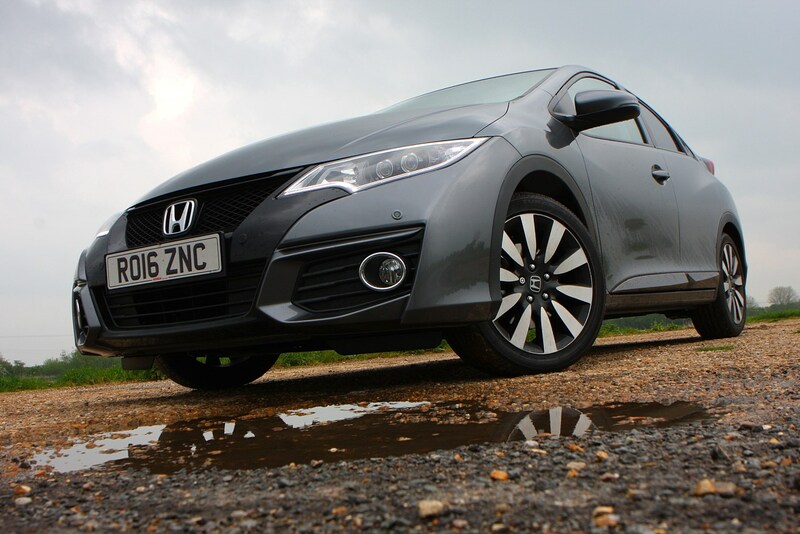 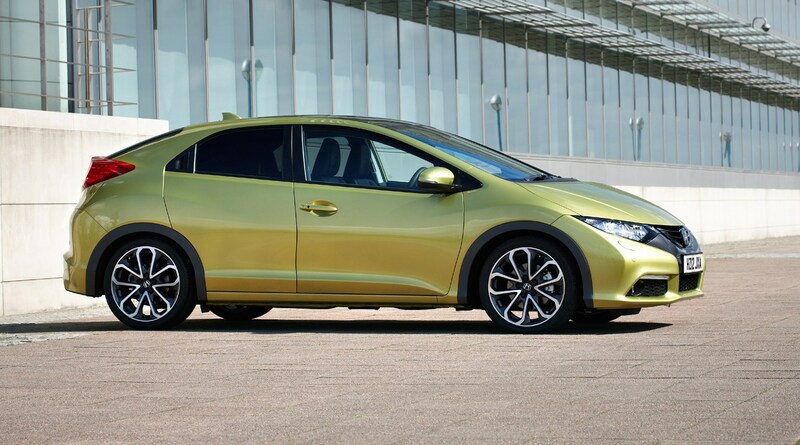 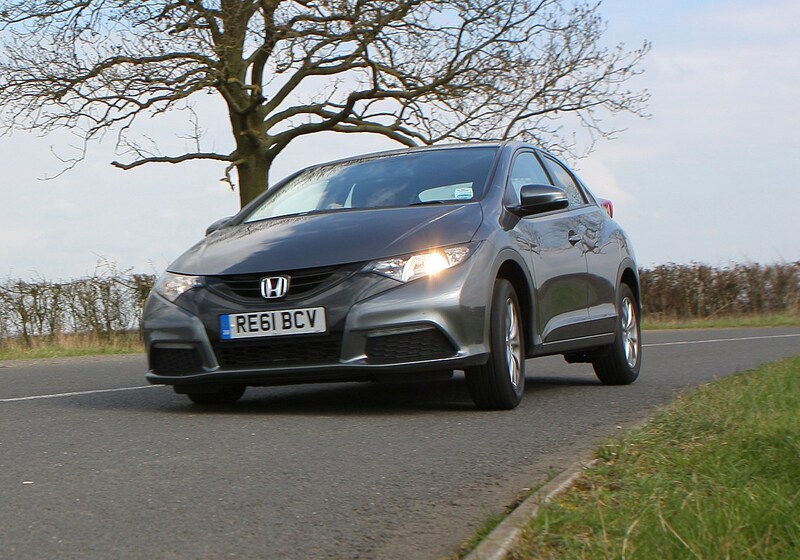 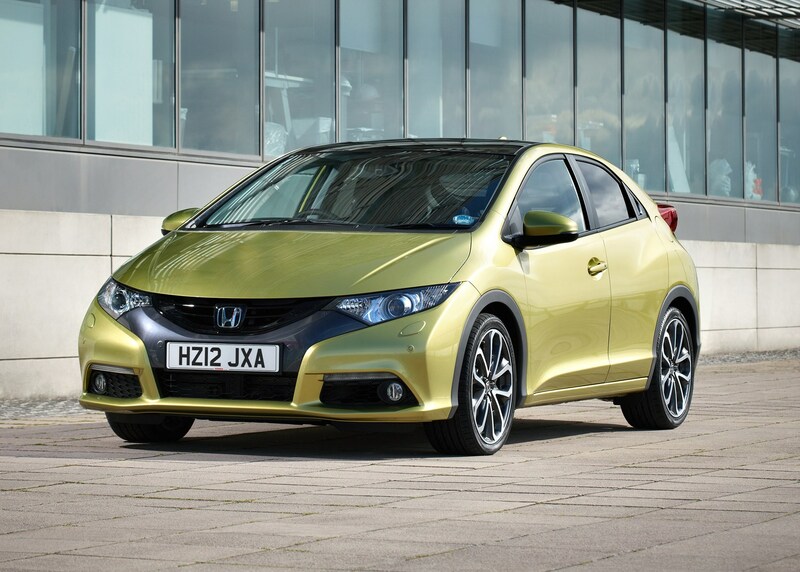 Honda Civic practicality is one of the car’s strong points. 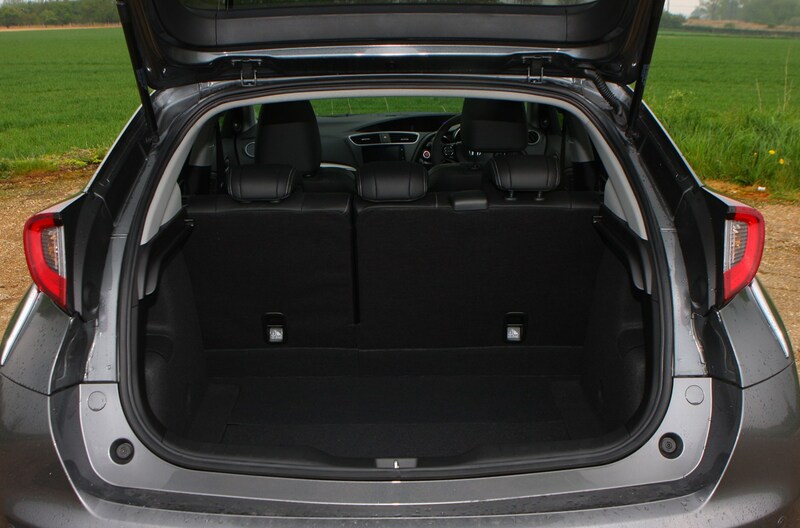 It's got class-leading luggage space with the rear seats up and when they are flipped down. 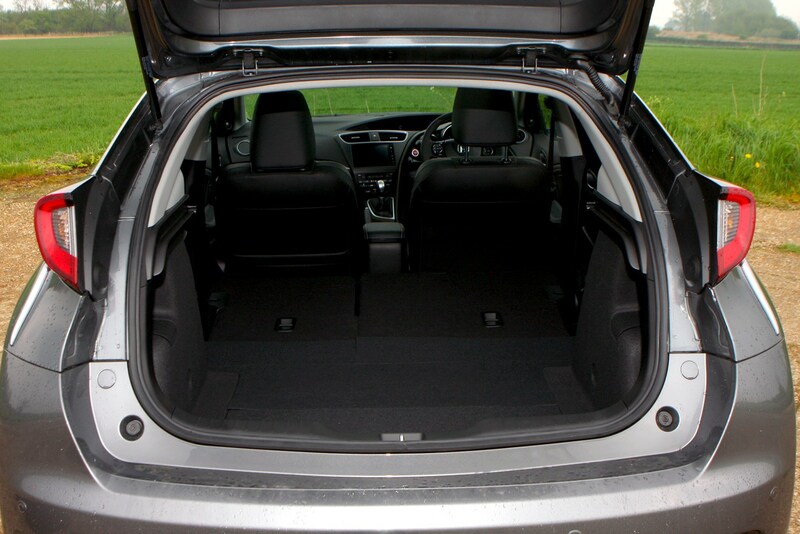 Seats up, there is 401 litres of space available while the under-floor compartment adds a further 76-litres. 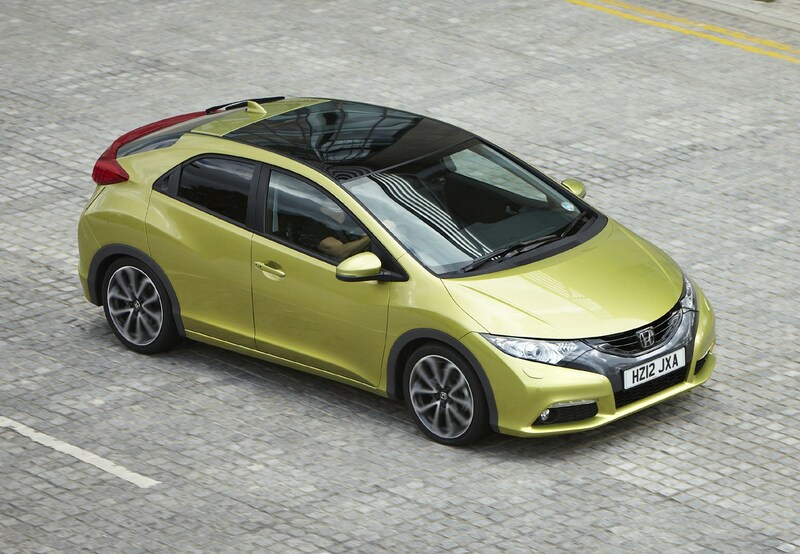 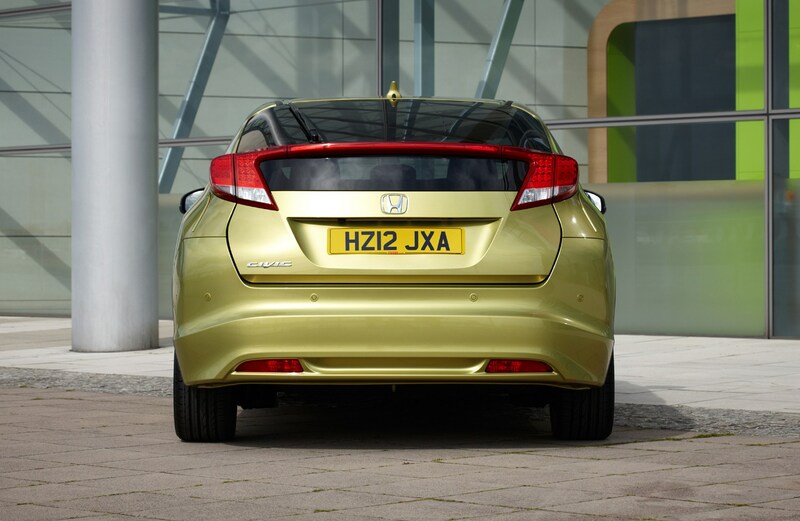 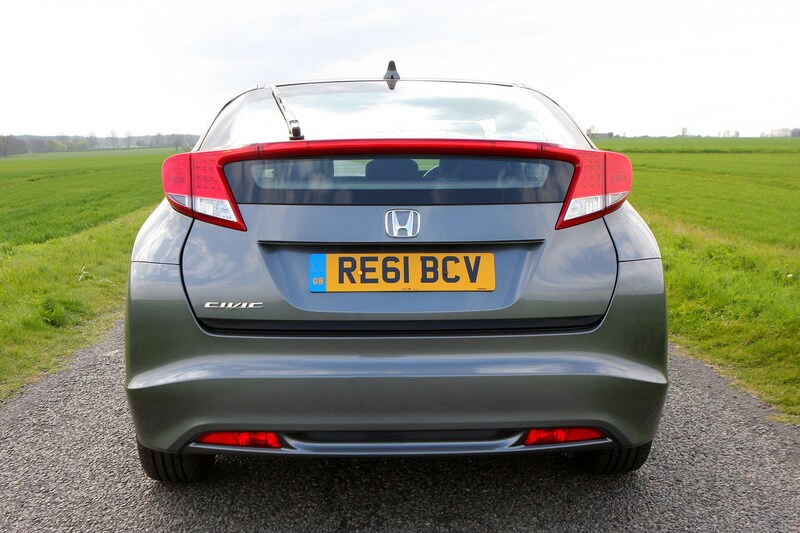 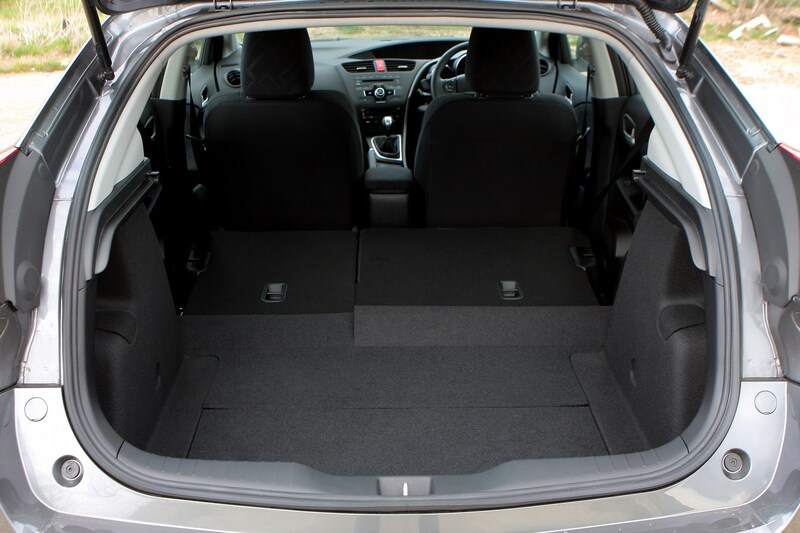 Drop the rear seats and the Civic can carry a maximum of 1,342 litres of luggage. 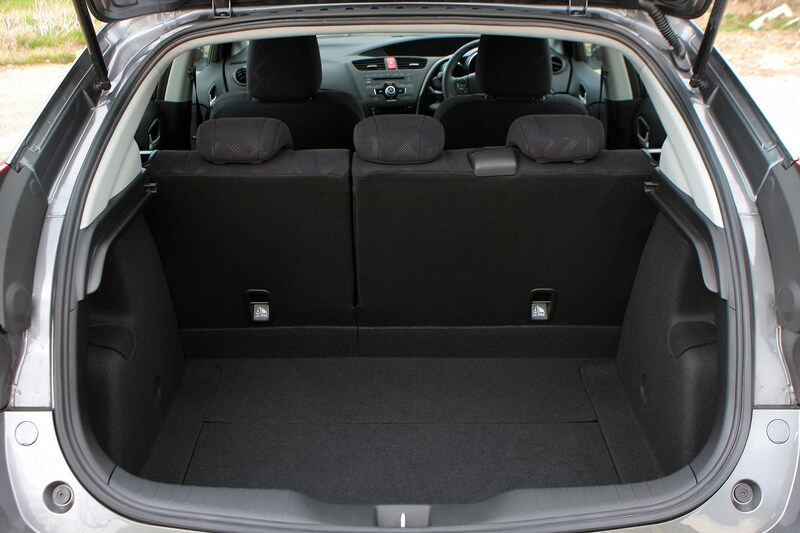 It's not just the cavernous load area that makes this car hugely practical, but the way it's achieved. 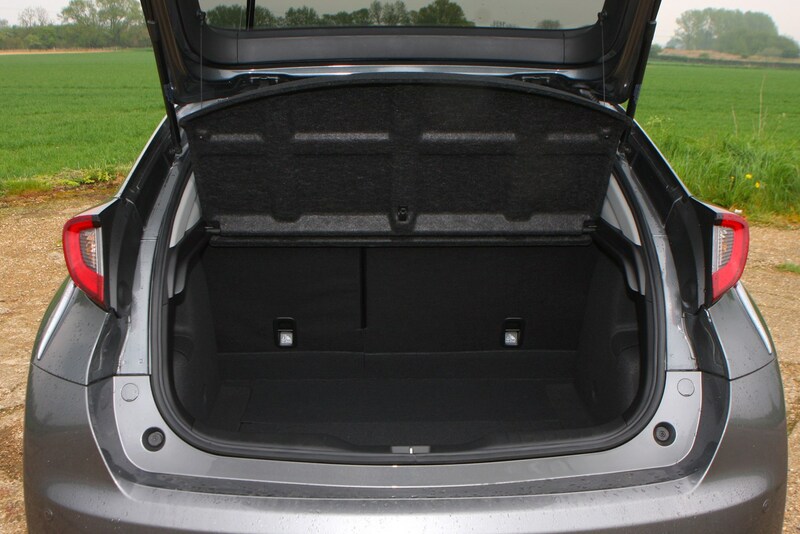 To get a flat loadspace you simply flip two levers down and the seat-backs fold down without any fuss. 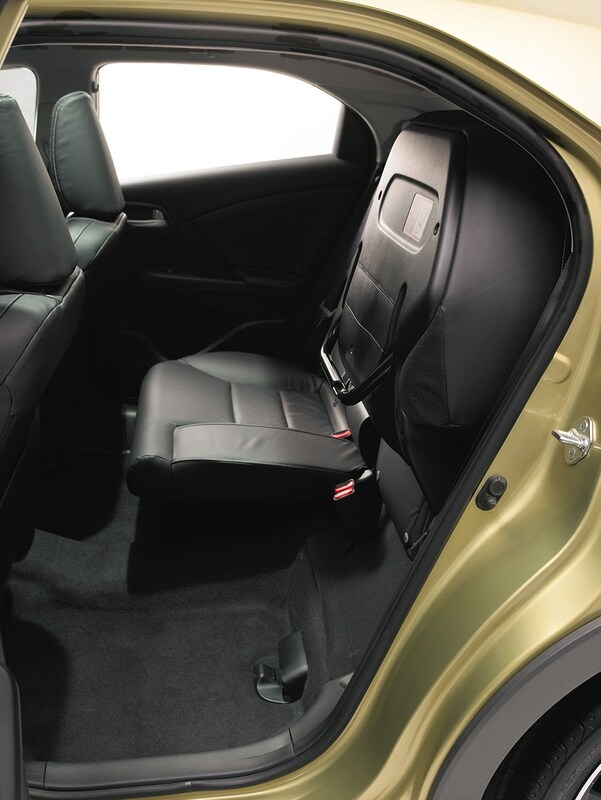 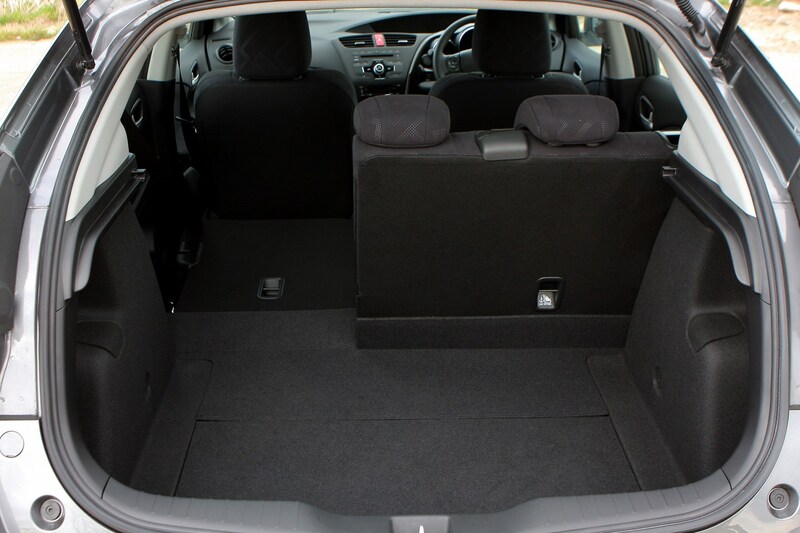 You can also fold the rear-seat cushions up to provide a loading area in the back. 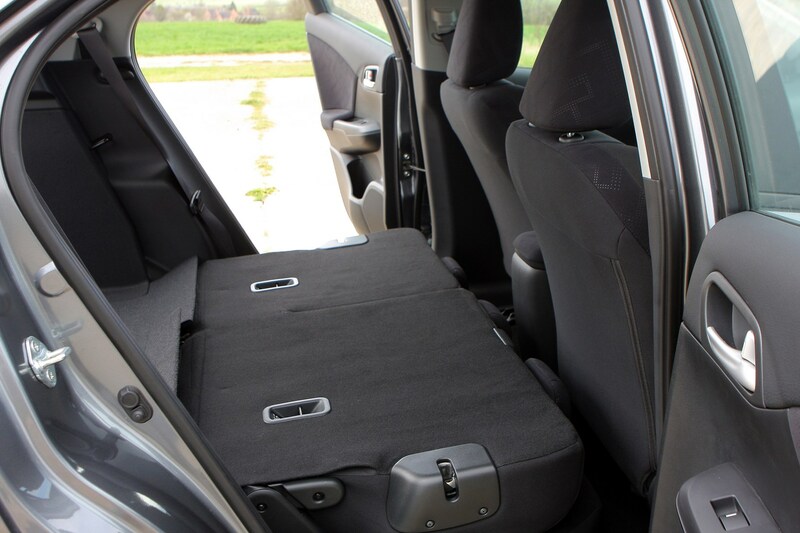 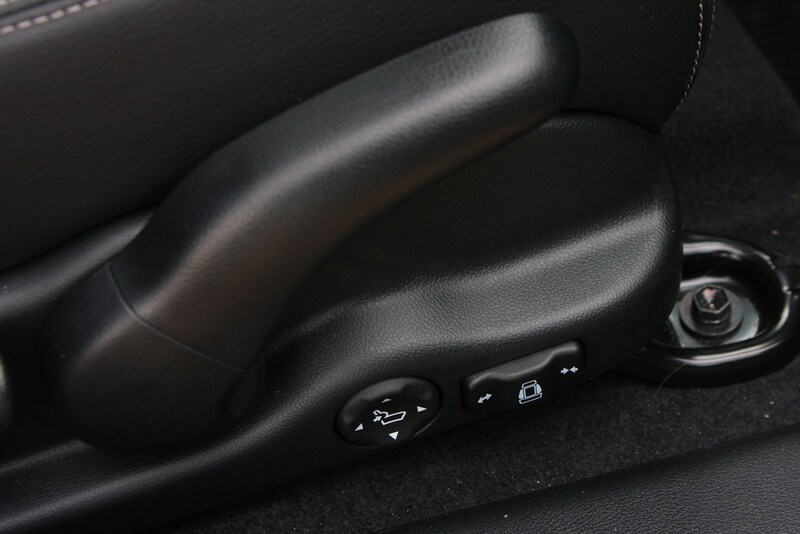 Honda refers to the rear seats as 'magic' and although there's no chance of making your dog disappear without a trace, they are very user-friendly. 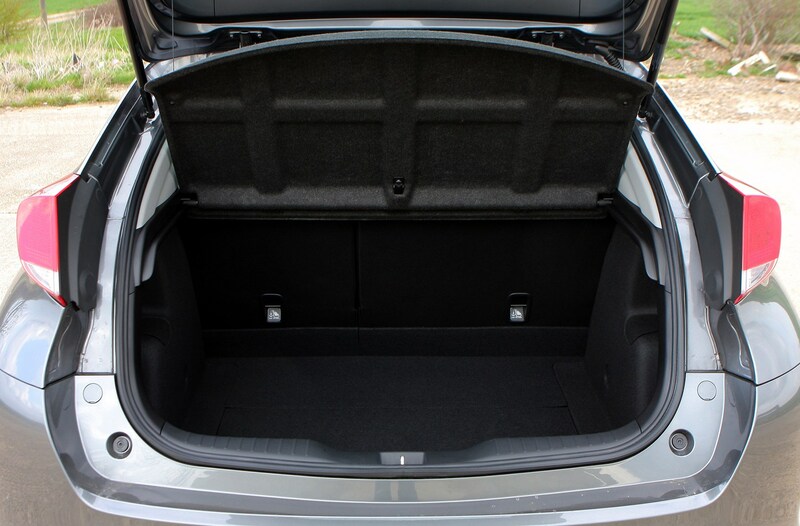 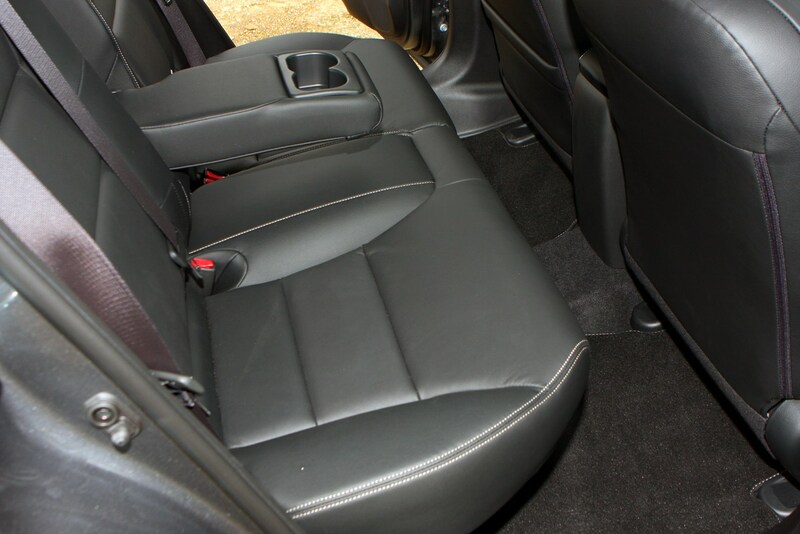 There's also a sizeable area in the floor of the boot to give extra storage space, which is very useful. 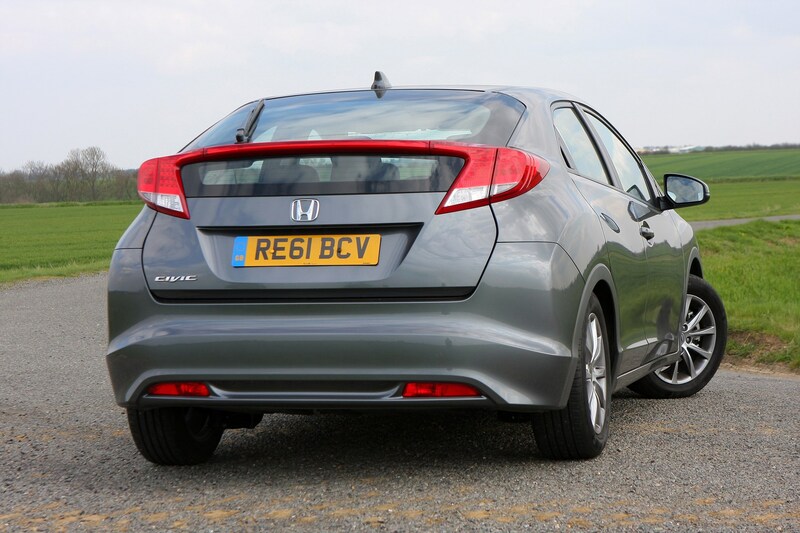 The Civic is only available as a five-door and although there's just enough rear legroom for adults, tall people might find it a bit of a squeeze. 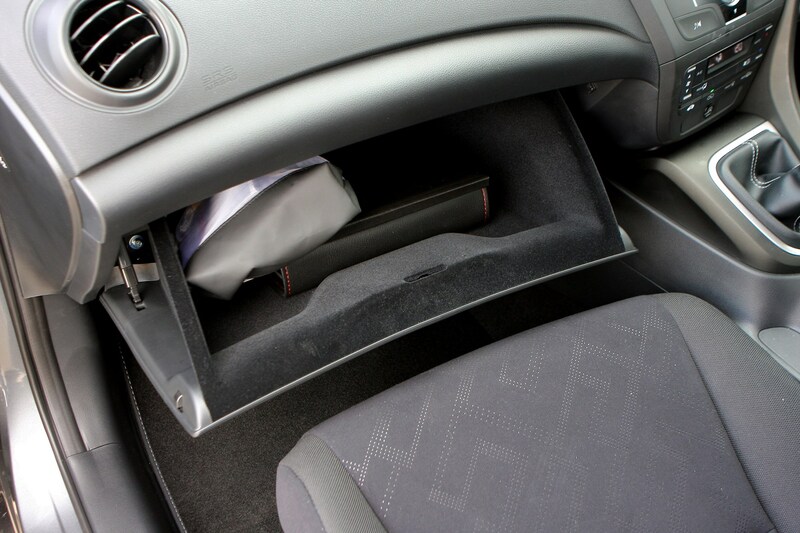 There's no shortage of cubbies in the front to hold phones and other frippery, and the glovebox is a reasonable size too. 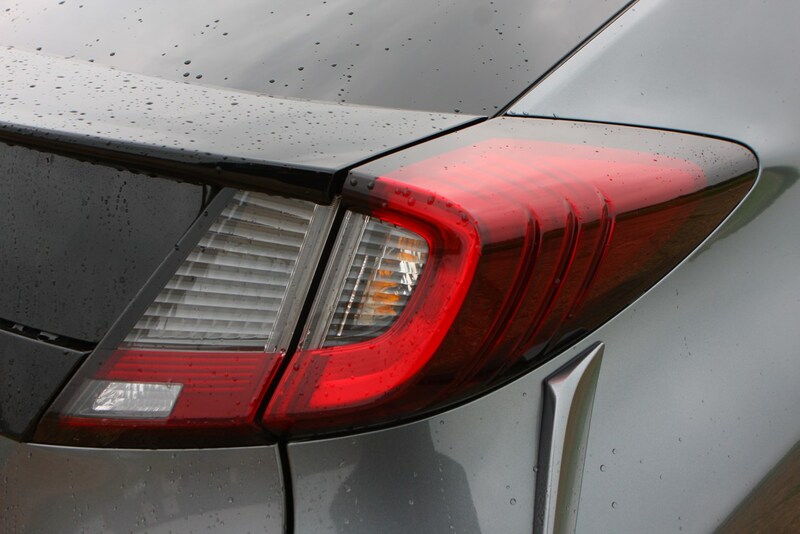 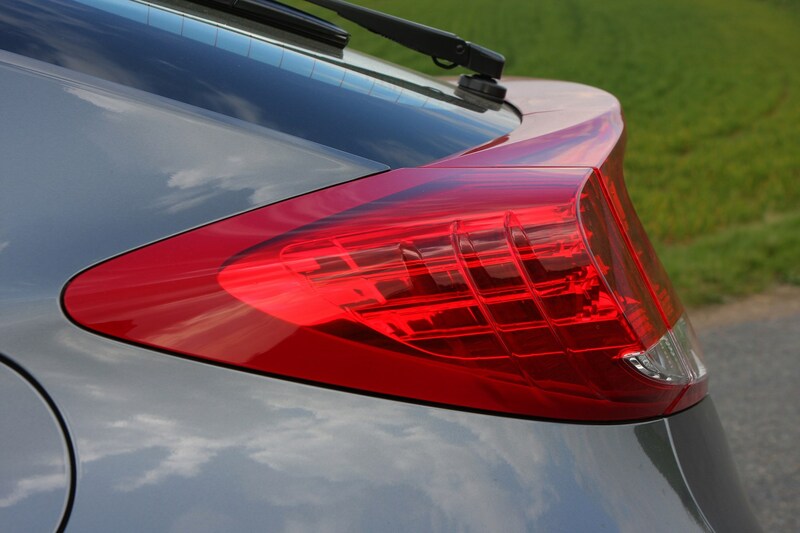 The major black mark comes in the form of the rear-spoiler that massively compromises rear visibility. 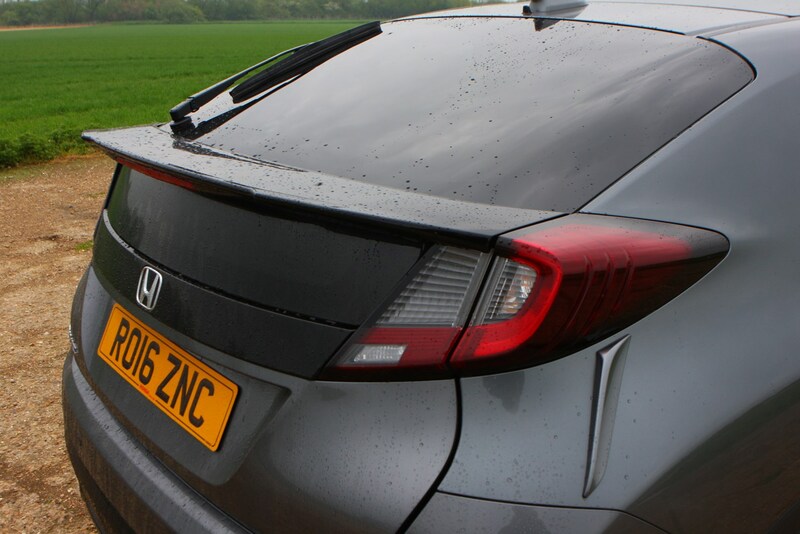 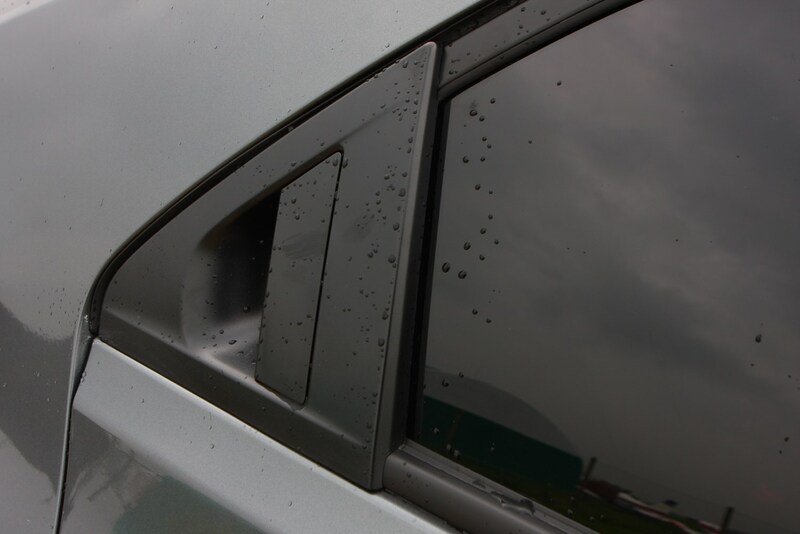 It's worse than the previous model too, because extra window space has had to be taken up in order to accommodate the rear wiper. 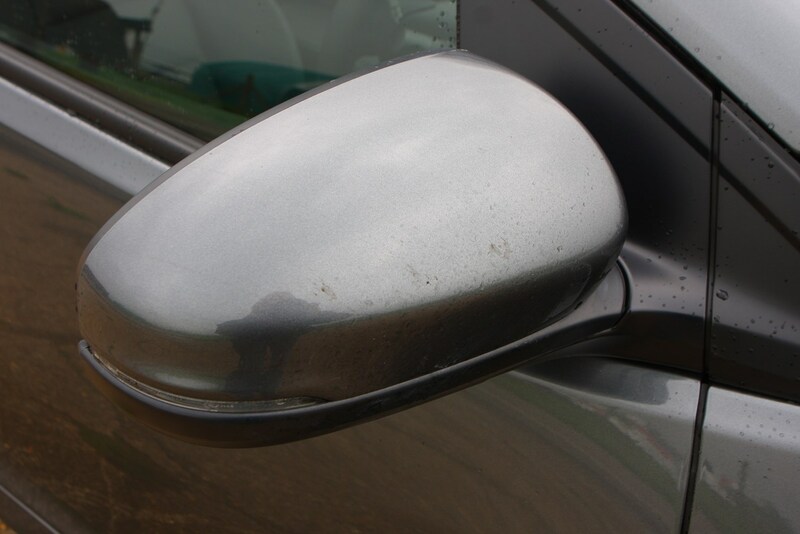 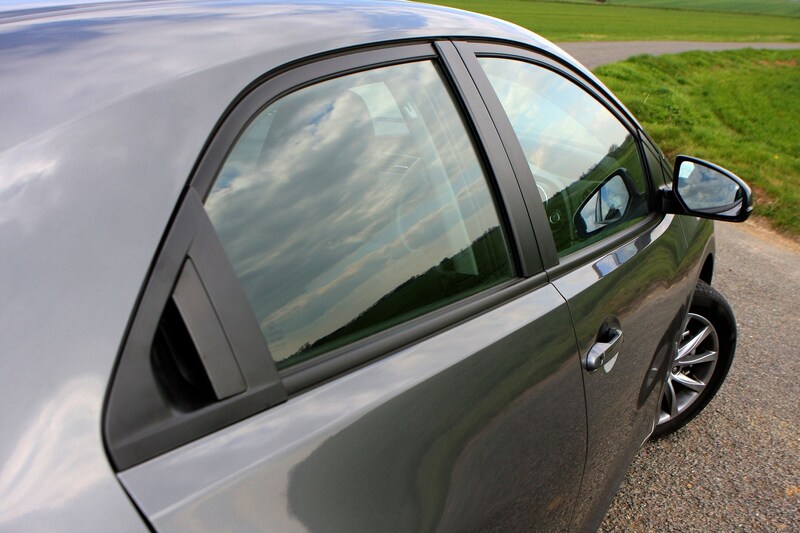 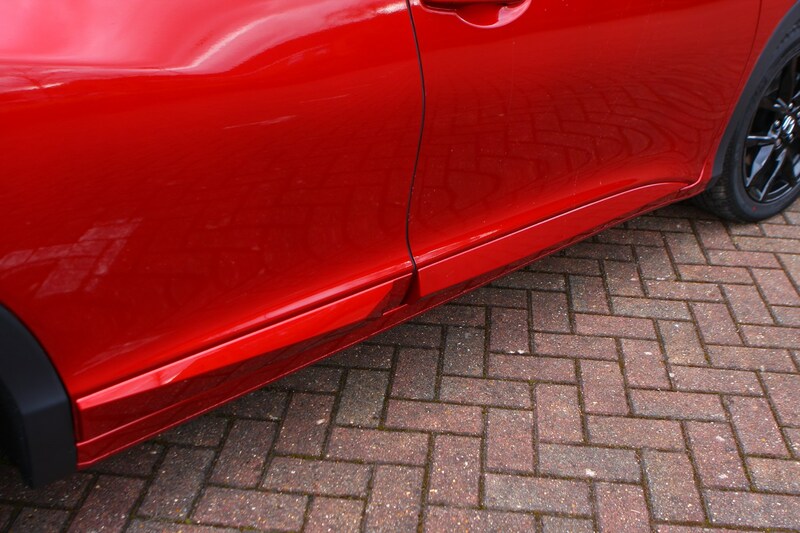 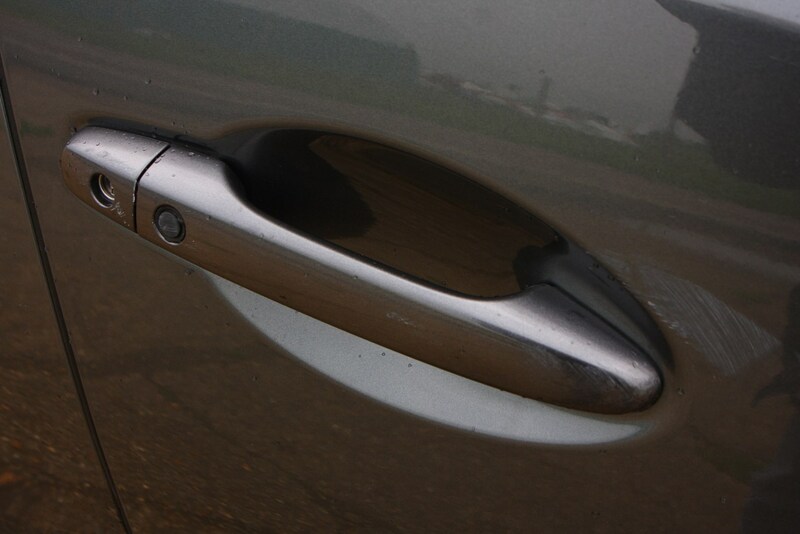 The A-pillars are also quite chunky and that restricts the view when you are pulling out of a turn at an acute angle. 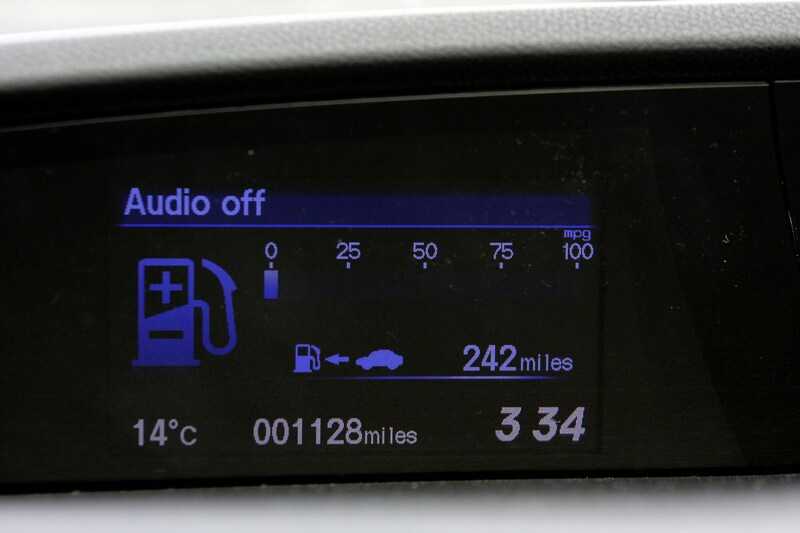 The sat nav wasn't that user-friendly either, although the stereo controls were logical and well laid out. 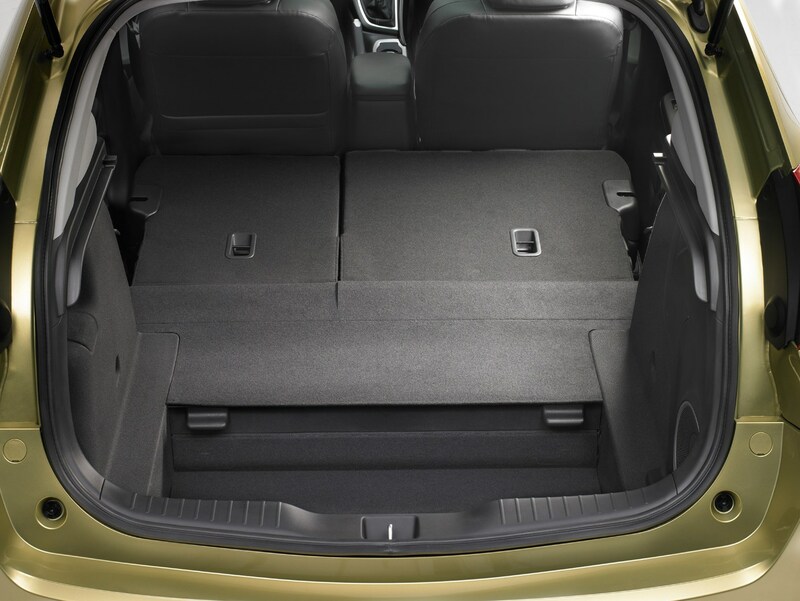 Check the table below to see how the Honda Civic Hatchback (12-17) compares to other similar cars in terms of available boot space.